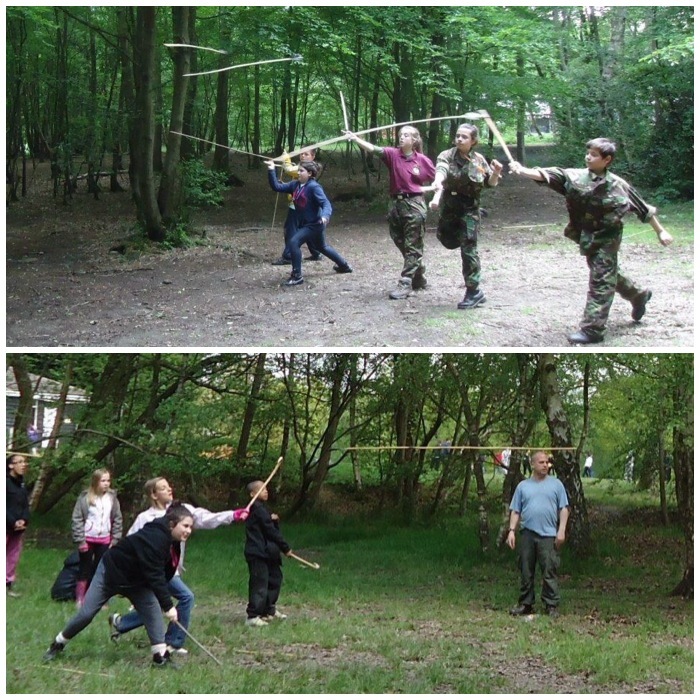 No pressure, no assessments, no worries – just fun, fun and more fun – these were the requirements for the recent London Area Sea Cadet Juniors training weekend at Crowborough Army camp. 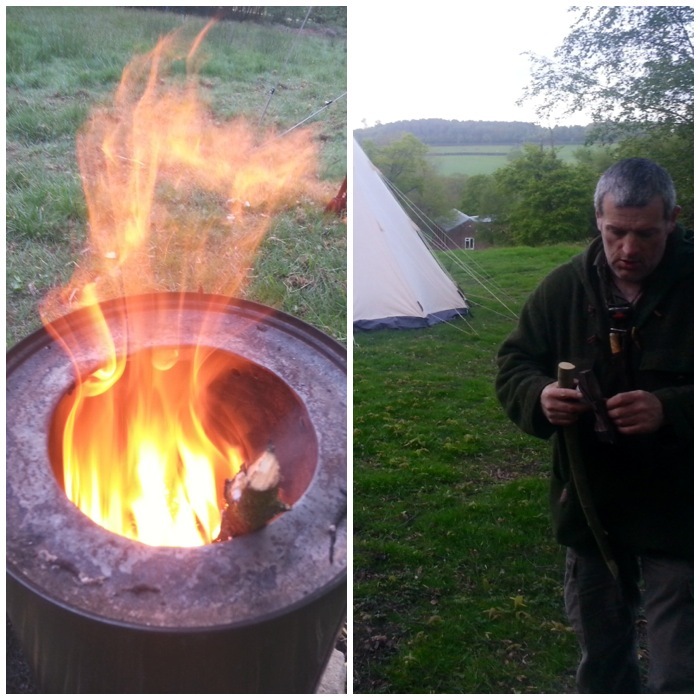 I was joined by my good friend Charlie Brookes for the weekend teaching some bushcraft skills to the cadets. 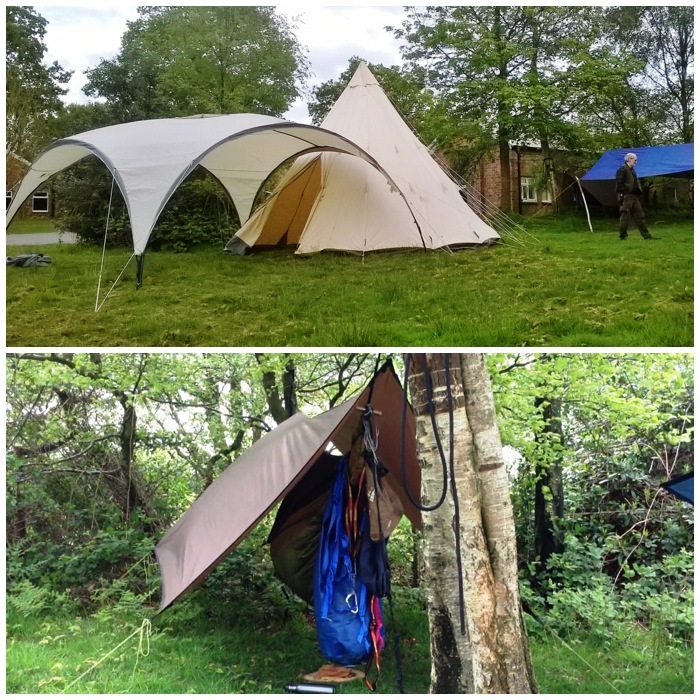 Also helping us were one our new Adventure Training instructors Emma Deasy and Leading Cadet Jessica Edwards (Jessica is under training to become an Adventure Leader). We set up our classroom and prepared for all our activities on the Friday afternoon. 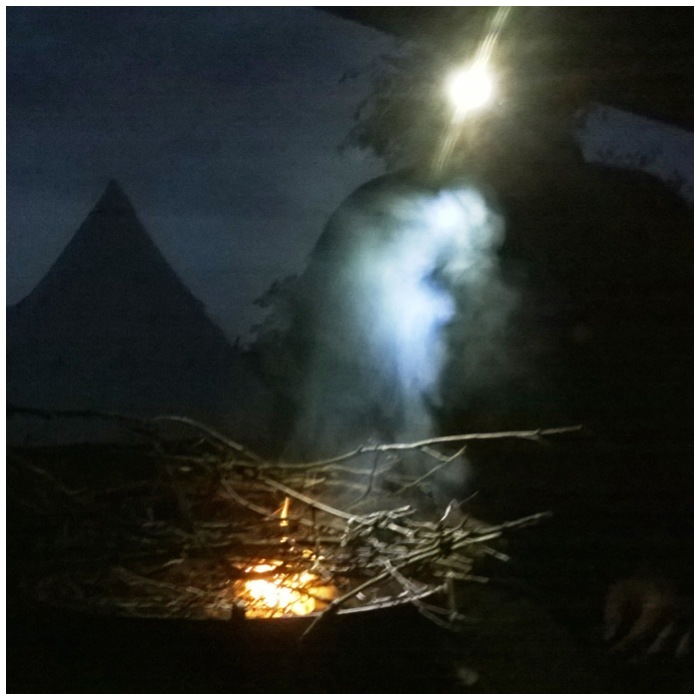 At this stage it was just Charlie and myself but as he is a top bushcrafter everything got set up in record time. As the cadets arrived on the Friday evening Charlie and myself relaxed around a nice fire and discussed how best to run the weekend. 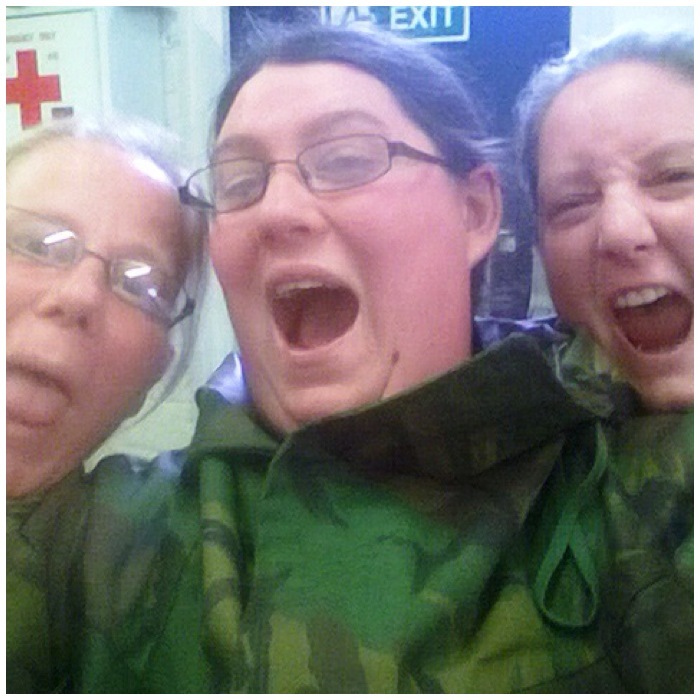 We did not have to look after the cadets in the evenings as there were enough ‘Duty Staff’ around to do this. 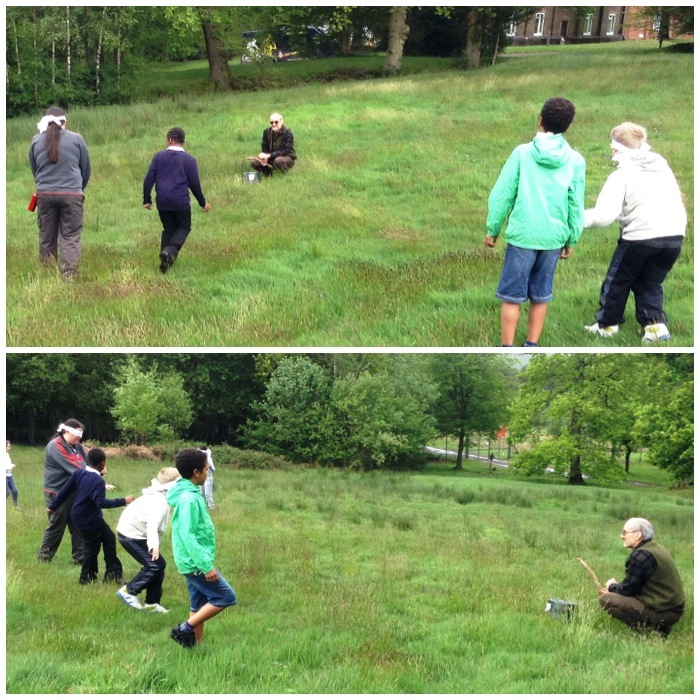 There were lots of activities planned for the cadets. The plan was for us to be given six cadets for an hour or so and then they would be moved onto other activities. On the saturday we had 3 teams in the morning and 3 in the afternoon. 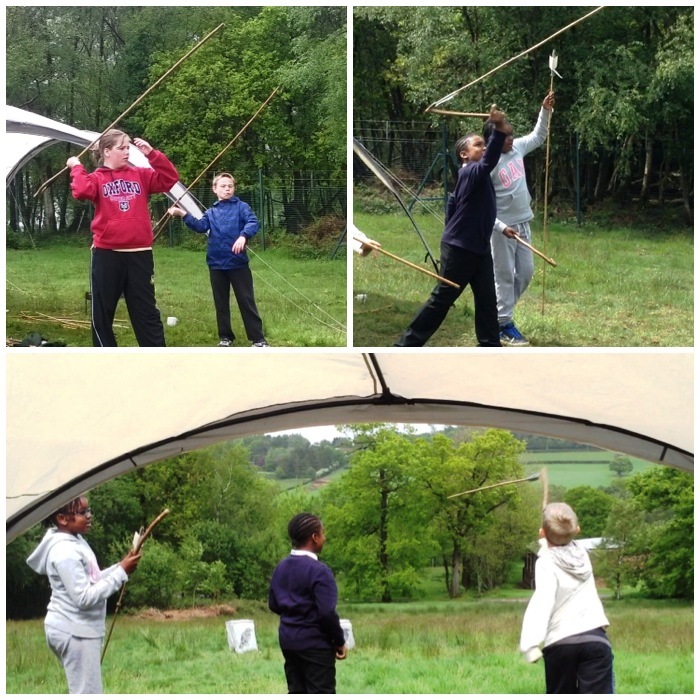 We ran various activities in each slot including the Atlatl, archery, fire lighting and stalking games. 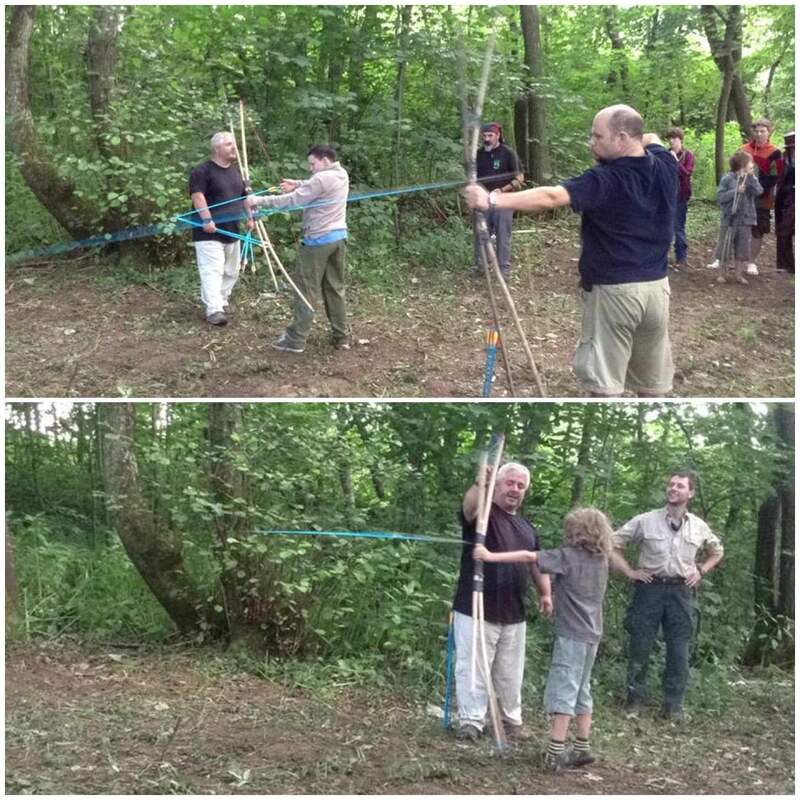 The Atlatl (a spear chucking device) has become a regular event at many of our courses. Just looking at these cadets you can see that they really enjoy this activity. I set up a short range of about 15 meters as I was more focused on accuracy rather than distance. 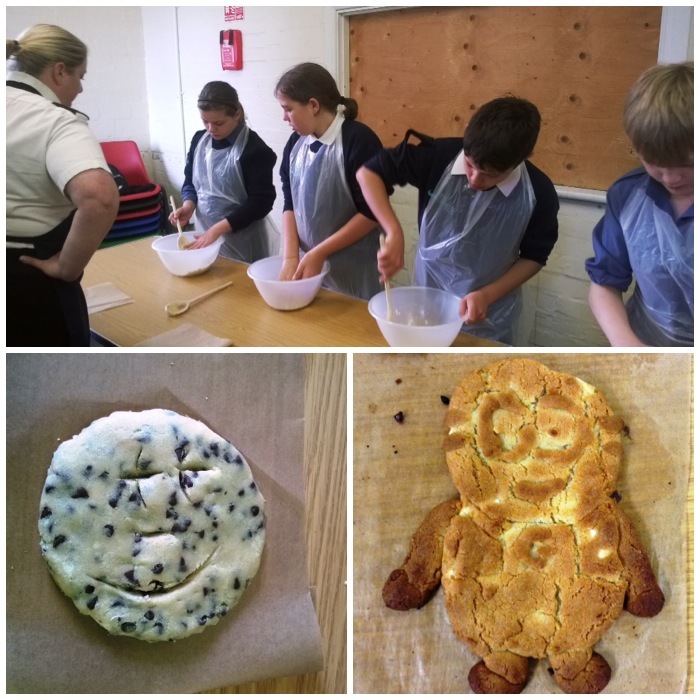 One of the other activities the cadets undertook was a cookery class (Cook Stewards course in the Sea Cadets). 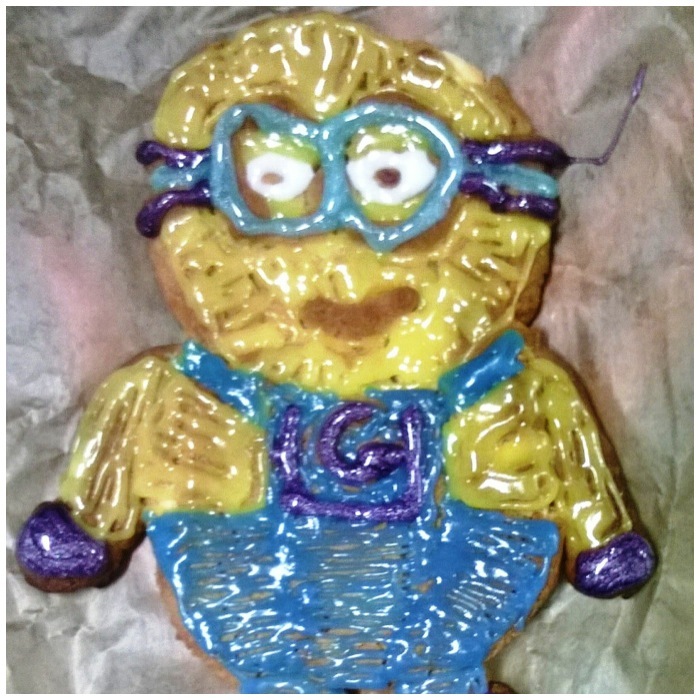 I was supplied on a number of occasions with some excellent cookies that were baked in this class and every time I went into the main building I was assaulted by a fantastic smell of baking biscuits. As you can see that the little fella in the picture just above on the right turned out to be a proper little Minion. This was baked by one of the other instructors Emma. 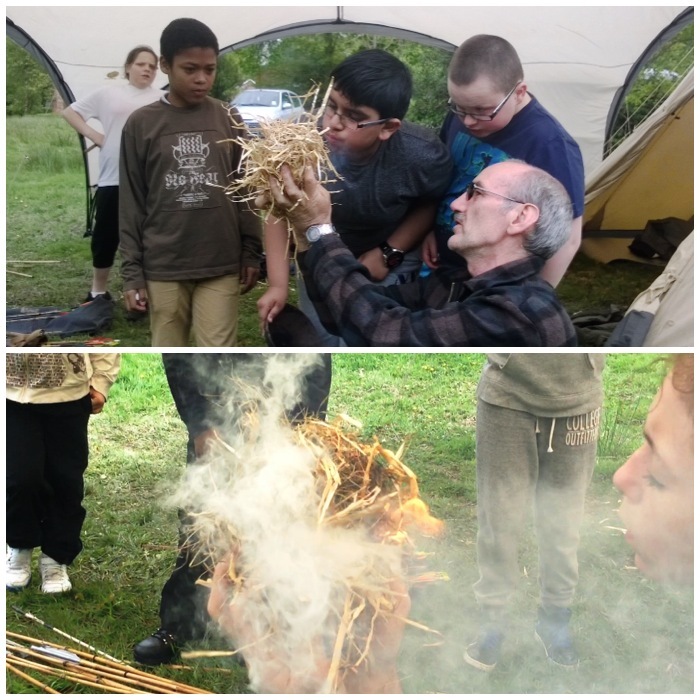 Charlie spent a great deal of the day teaching the cadets how to light a fire in many different ways and also about the responsibilities they need to think about when lighting a fire. 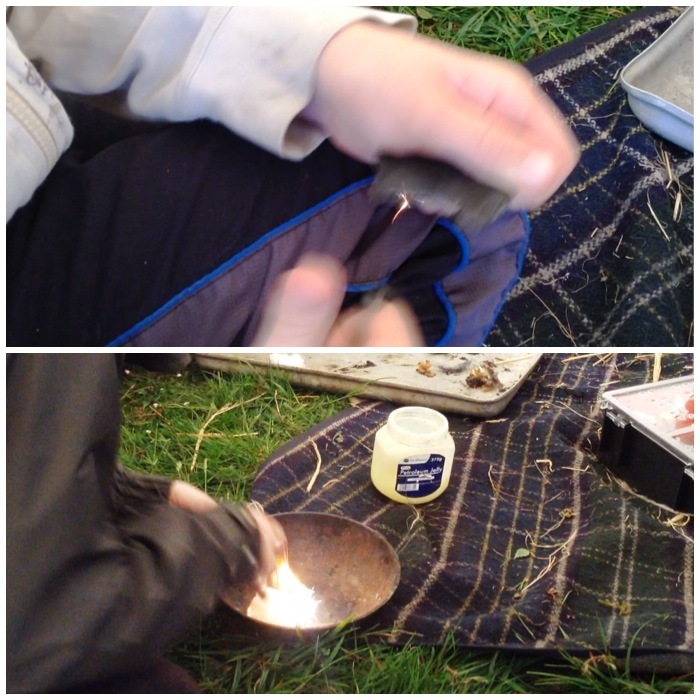 In these pictures the cadets are using traditional flint and steels on the left and more modern firesteels on the right. Some take to this straight away and others require a little bit of a helping hand. 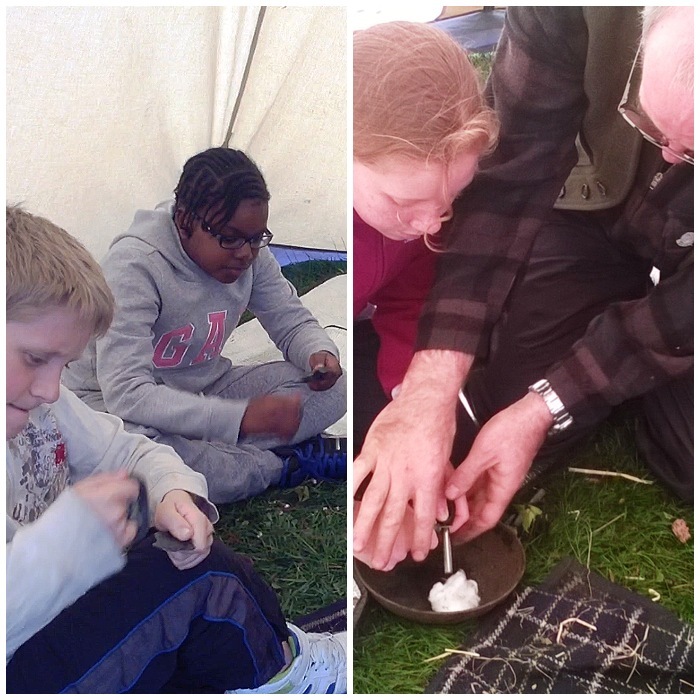 In no time the cadets were creating good sparks from traditional flint and steels and lighting up cotton wool balls smeared in Vaseline with modern firesteels. 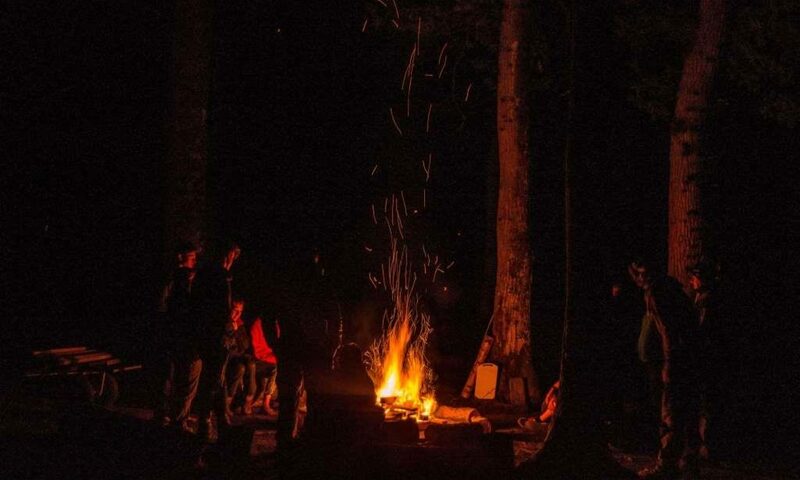 The cadets also lit lots of charcloth and soon had good tinder bundles going. I put together a short video showing all these activities. A little toy that really caught the attention of the cadets was the parabolic mirror. This is a concave mirror that you can use to light a small piece of material just using the suns rays. 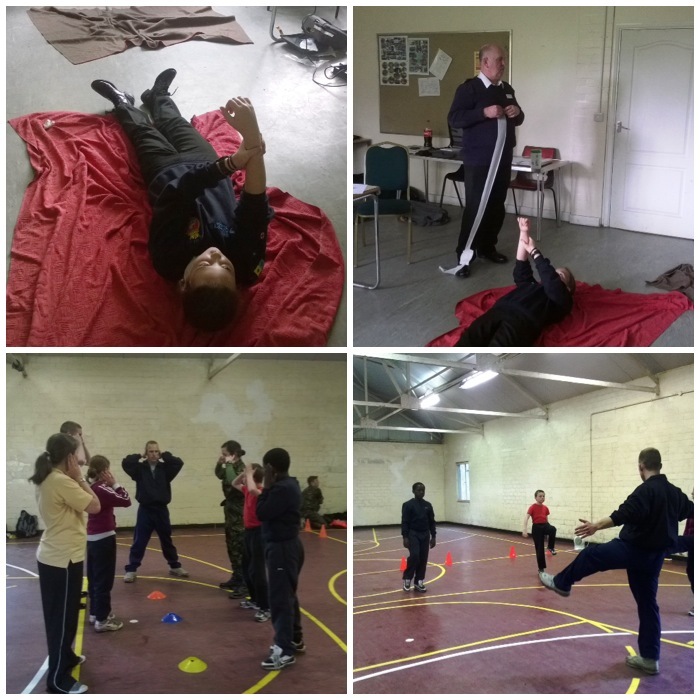 Other classes the cadets undertook included First Aid and Physical Training. One of the activities I like to teach the cadets is about listening correctly while out and about. They all come from London so for many they do not truly listen to the countryside when out and about. to begin with I get them to focus their listening by cupping their hands to their ears. This really increases the sound volume from the direction they are facing and as they turn around they can clearly hear everything coming from quite a distance. 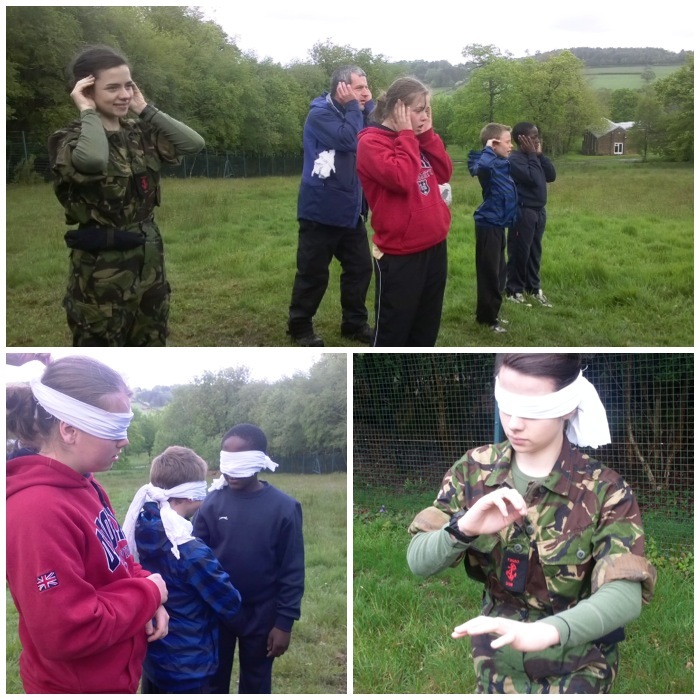 After they get used to this we blindfold them so that they can appreciate how much sound can help us with spotting animals in the woods. The drum stalk is a game where the participants are blindfolded and have to walk from an unknown spot (to them) and touch the head of the drummer. The drummer gently taps the drum (a bucket in this case) to give the participants a focus to walk to. 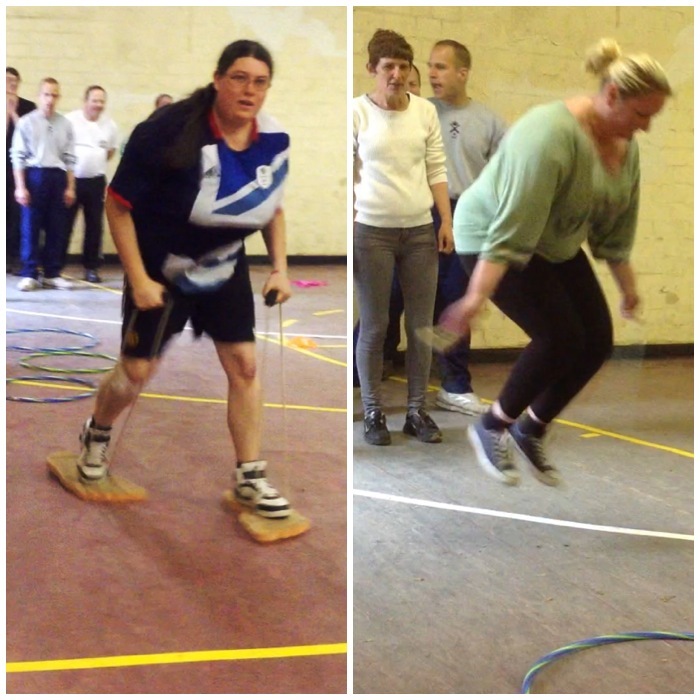 Each participant has a guide walking by them to make sure they do not fall into any holes or trip over anything. 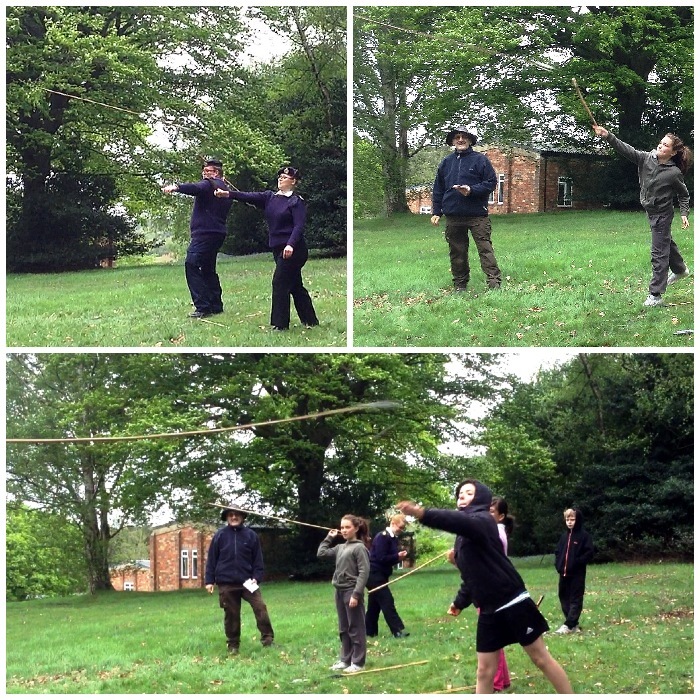 Being Sea Cadets a training weekend would not be complete without a class on Seamanship and on Comms skills. 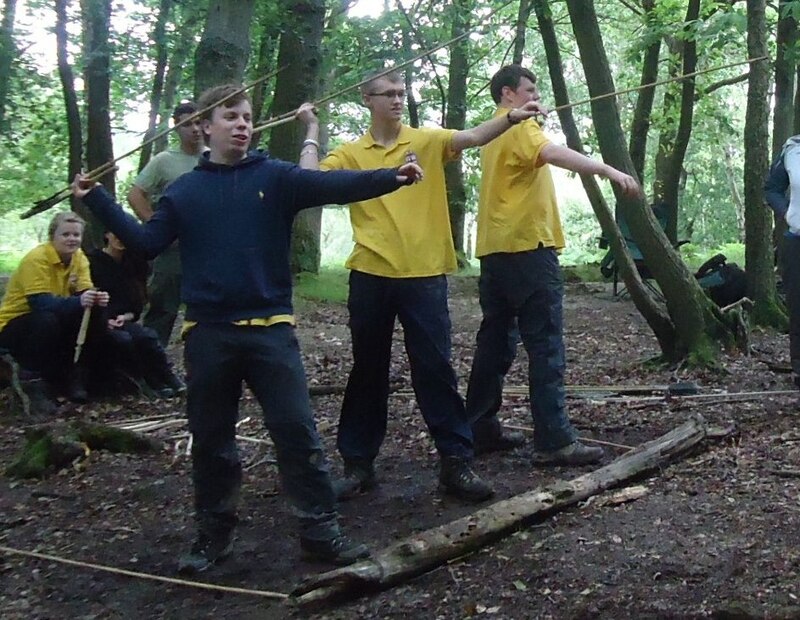 In Seamanship the cadets learnt how to make a monkeys fist – this is a type of knot that creates a weight using the rope and is used for throwing a heaving line from a boat to the shore in order to tie it up. 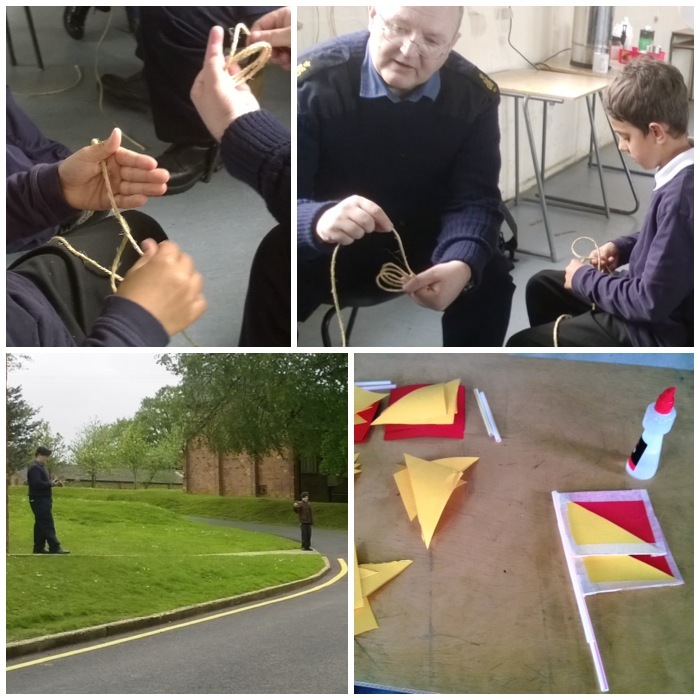 In the comms class the cadets learnt all about how to use radios properly by getting out and about using hand held radios and they also made their own semaphore flags. After each Atlatl session I also got the cadets to shoot some arrows down the range. I managed to get some cracking shots this time of the arrows being released. 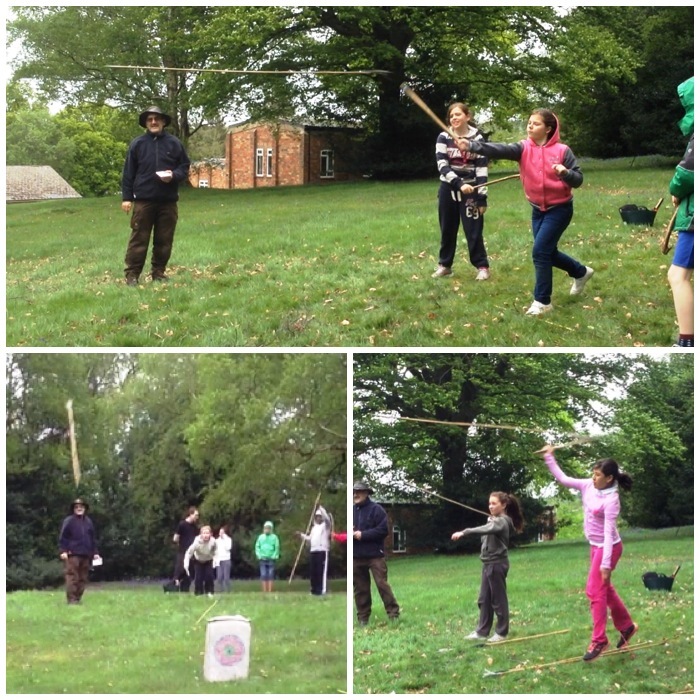 On the Sunday morning a competition was held and we set up an Atlatl range so that the cadets could try out all the skills they had learnt the previous day. The cadets were definitely better than the staff with both accuracy and enthusiasm. 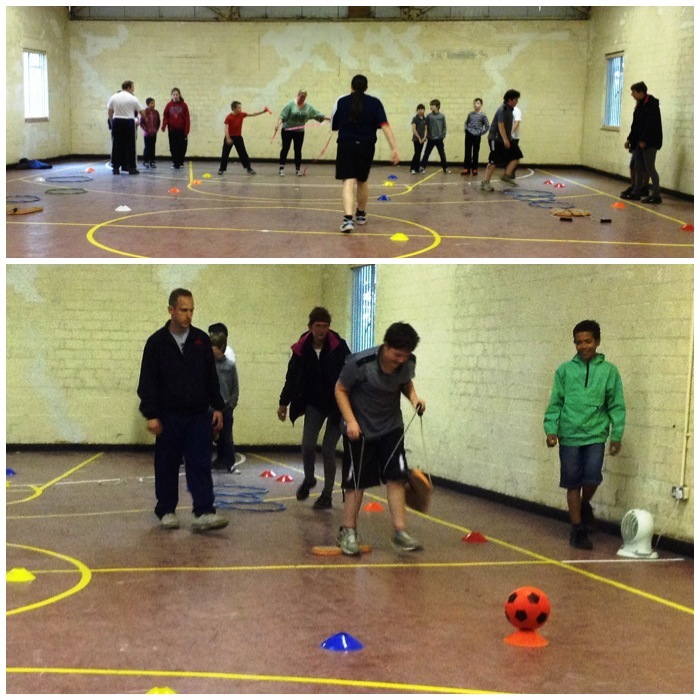 The PT staff also set up an indoor sports competition for the cadets. I walked into the hall and the noise of all the cadets egging their pals on was amazing. A staff team was put together and thankfully as I was seen to be too busy filming was left alone. In all the madness and fun that was being had I have no idea who won. In amongst all this fun we did find time to do some other stuff. Charlie tested out a Wood Gas stove and I managed to do a little pot hook carving (a How To on this to follow). A great weekend with great Sea Cadets both young and old. One of my favourite Atlatls is the Lovelock Cave Atlatl. 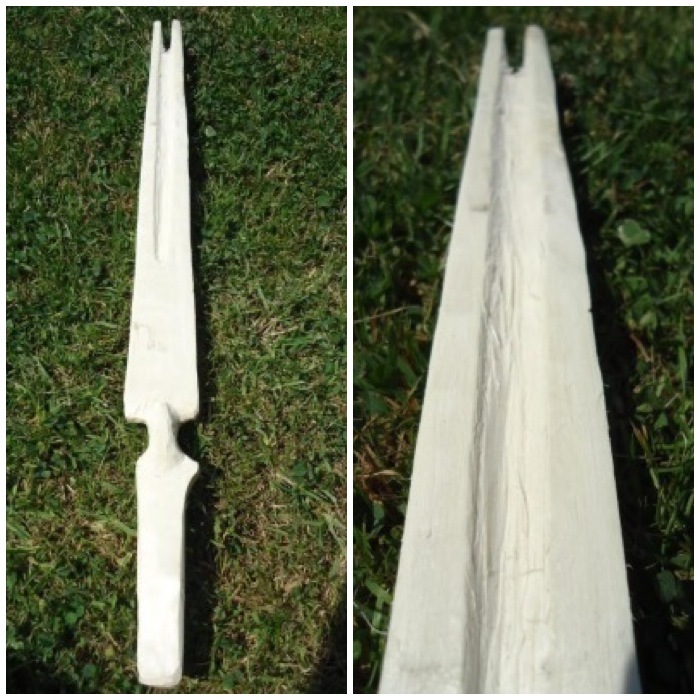 I made this Atlatl a few years ago using modern tools including a Mora knife, a small carving knive, a flex gouge chisel and sandpaper. The original Atlatl was found in a cave over a century ago but was soon lost; thankfully, though, not before someone had made a detailed drawing of it. 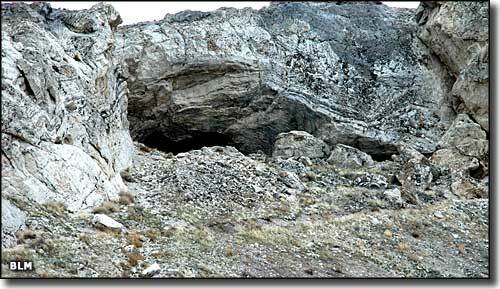 Lovelock Cave was previously known as the Sunset Guano Cave, the Horseshoe Cave and Loud Site 18. A good paper on the archaeological digs on the site was written by Phoebe. A. Hearst from the Museum of Anthropology (University of California Berkeley). 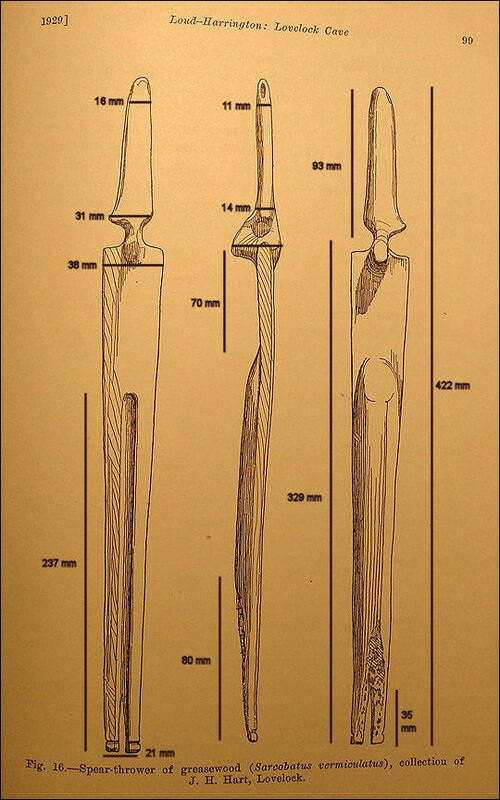 A copy of the drawing is shown below: I found this in a post by Mike Richardson on the Split Stick Atlatl, who also writes that the original was 17 inches long. I reproduced the Atlatl as closely to the drawing as I could. It has a fork at the rear and the drawing shows a small groove around each prong. I have read that this was where a small piece of carved wood or bone known as a spur was attached as a point to hold the Atlatl. 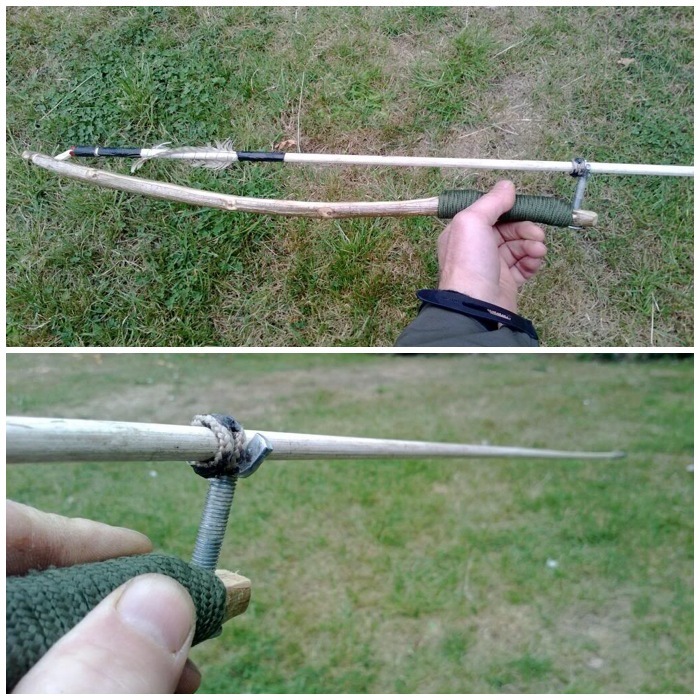 I decided though to see if the Atlatl would work with just some cordage wrapped around it. There is no historical evidence that this was done but it does work well. 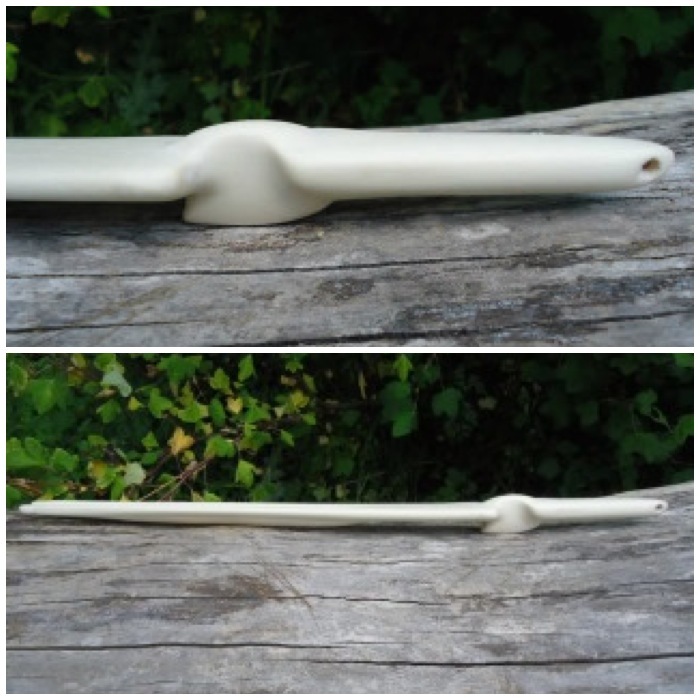 A good comparison of both attachment types on this Atlatl can be read in the PaleoPlanet forum here. 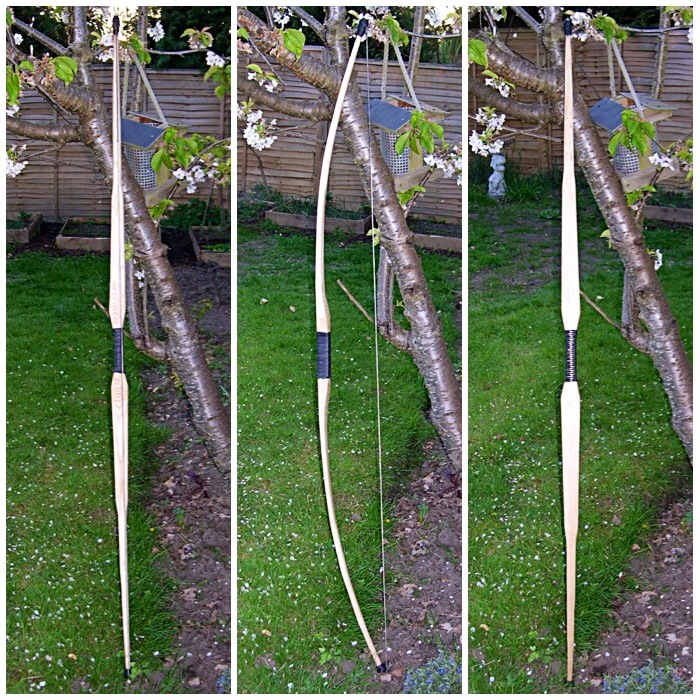 A further project for me on this Atlatl is to make a spur for it. Knowing that the original was 17 inches long, I made a best guess at the other dimensions. 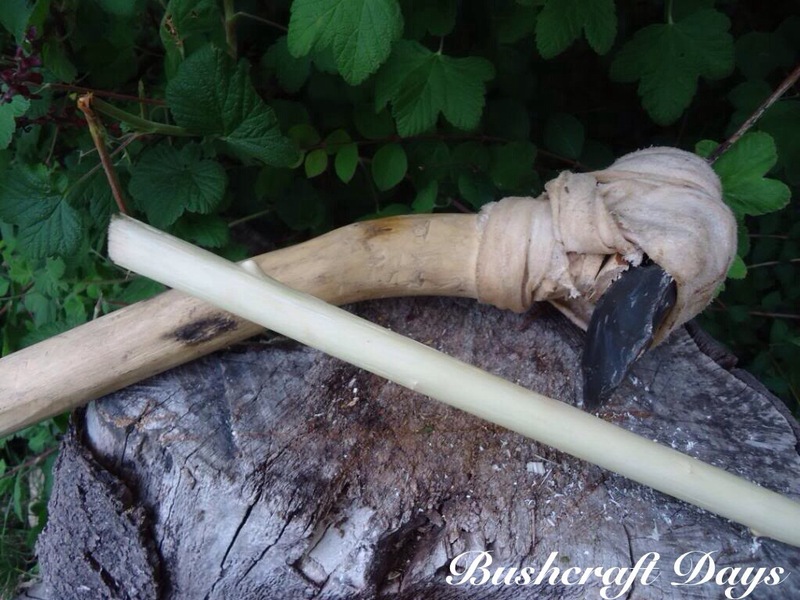 The original Atlatl that was lost was made of Greasewood (Sarcobatus vermiculatus) but as this wood is not available in the UK I opted to use a piece of Siver Birch (Betulus pendula) as I had some available and it is easy to carve. 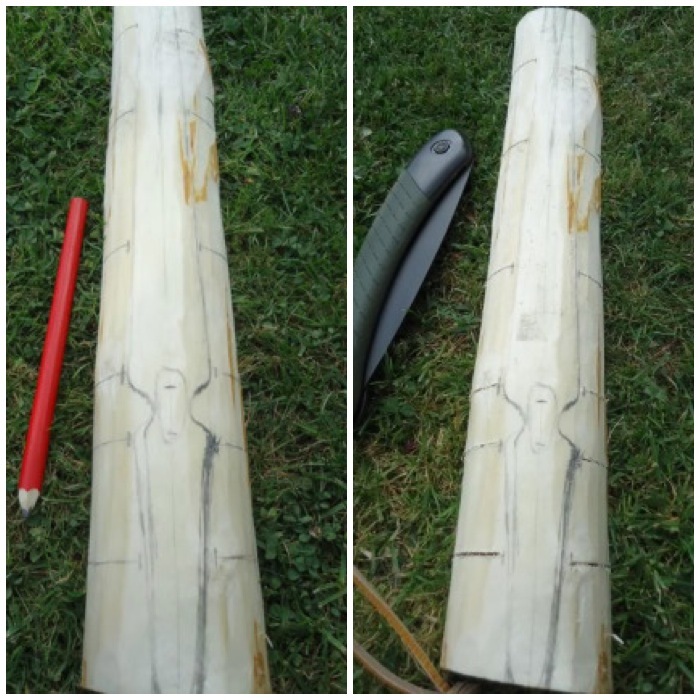 The wood I had ready was only 16 1/2 inches long (422 mm to be exact) so using that as a starter and the drawing as a guide I scaled up all the other dimensions as shown below. 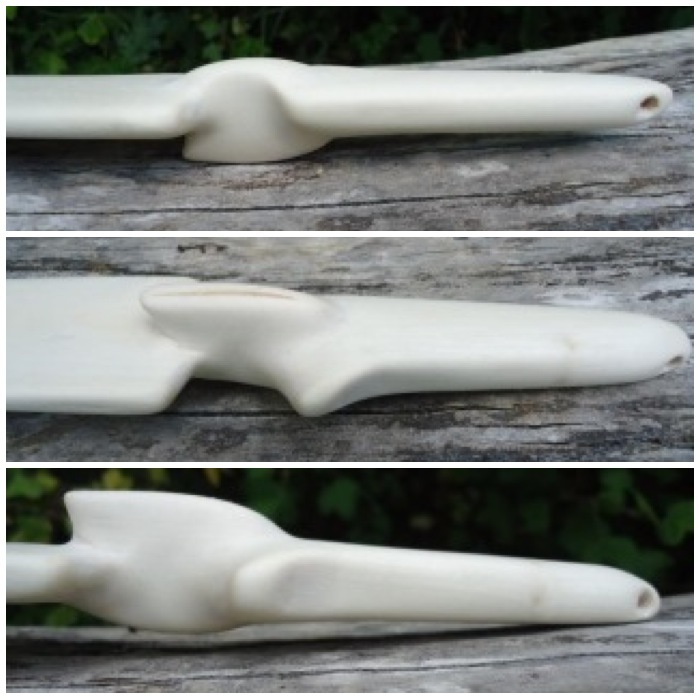 This was a beautiful Atlatl to carve as the finished lines are very smooth and pleasing to the eye. The top picture (below) is a close up of the handle of my reproduction. The final shape gives a surprisingly good grip even when smoothed down. 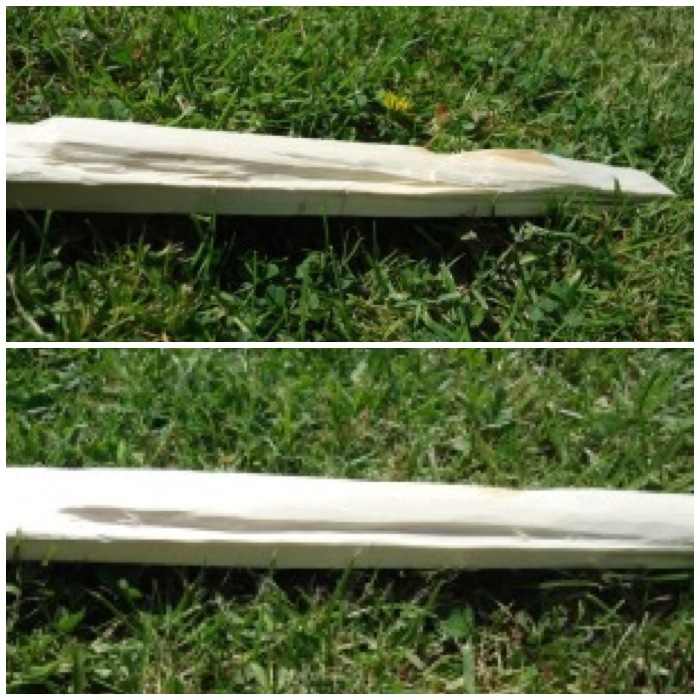 I split my log down to a rectangular shape and then using my dimensions drew out the shape of the Atlatl. After that I marked stop cuts along the whole length of the Atlatl and cut into them with my saw, finishing a couple of millimeters from the outline. 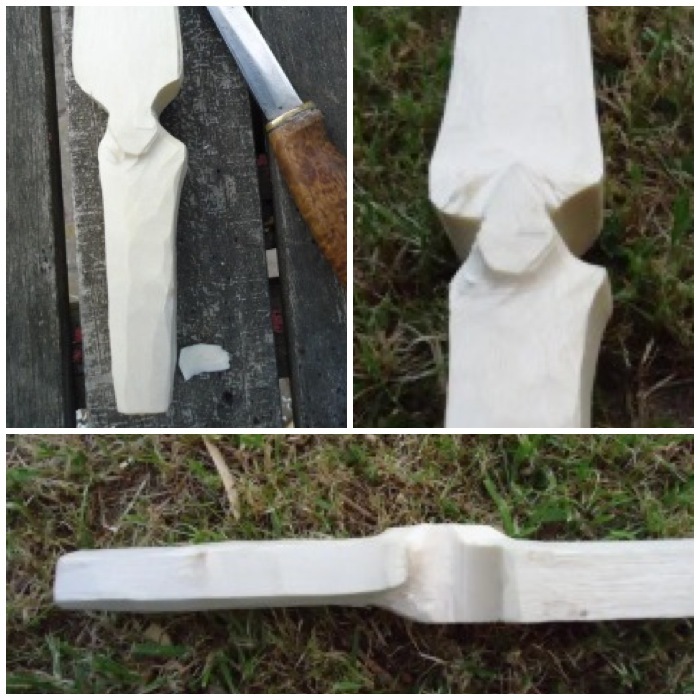 These are useful to have in place to stop any splits from running off down the length of the Atlatl when you carve it. I battoned out the rough profile first using only my knife and a small branch as a hammer. I did the battoning with the work piece placed on a log in front of me. I kept the blade of the knife at 90 degrees to my body as I hit it so that if the knife slipped it would swing away from my body. See my post on Knife Safety Tips for more detail on this. Then using my knife I trimmed the excess wood down to the line, keeping the work piece well in front of me to avoid any potential cuts from the knife if it slipped. Using two more stop cuts I carved out the thumb and forefinger grip area. Then it was a case of roughly carving the handle area down to a size comfortable for my hand. I also started to carve out the protruding areas above and below the thumb and forefinger grip area. I worked on the bottom of the tail next, carving a flat area near the handle and then carving out an elongated bowl shape to the tail. No need to worry too much about perfection at this stage as the sanding will produce the final shape. I tapered the tail area all the way to the end making a flat section of the final 8 cms (this will form the prong). On the top of the tail I marked out with my knife tip a 1 cm wide by 23 cm long spear shape that would form the bowl for the dart to rest in. I used a Flex Cut Gouge for carving the bowl area and my small carving knife for carving the prongs. 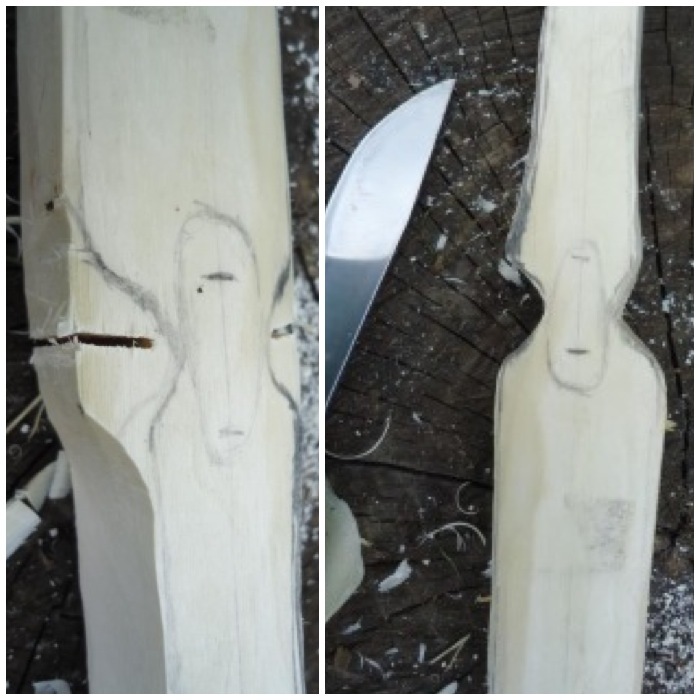 This is the really tricky area of carving – you have to be particularly careful as it is very easy for the knife to slip. Once I’d carved the basic shape I used various sandpapers from about 40 grit to about 1000 grit to smooth everything. Before I added the false sinew to the tail I oiled the Atlatl a couple of times and then boned it with a small pebble. 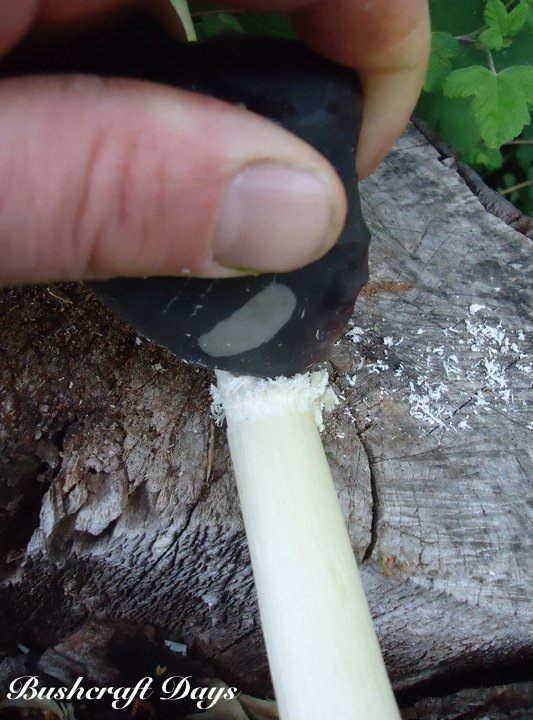 Using a small pebble to rub the Atlatl wood down for a couple of hours smooths the wood fibres down and traps the oil in the wood. The whole process of boning really gives a smooth finish. 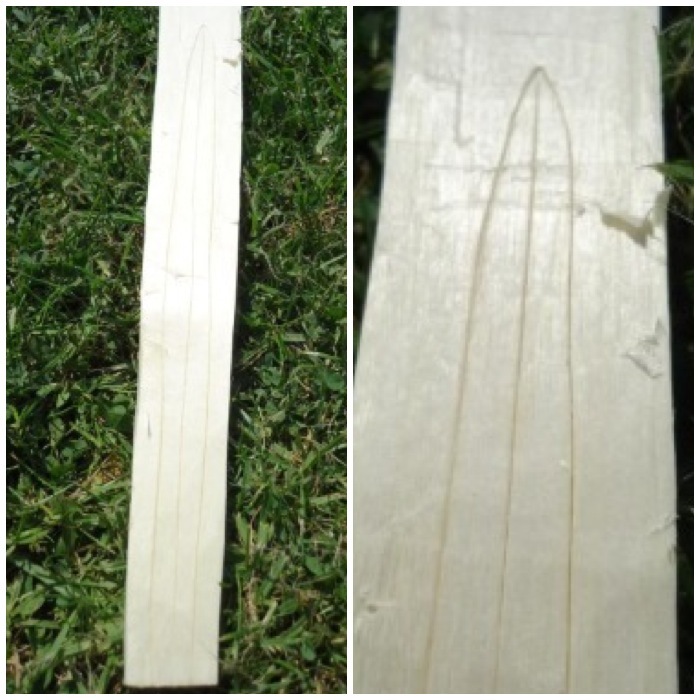 The finished profiles of the Atlatl. The handle has a very unusual shape but gives you a fantastic grip. 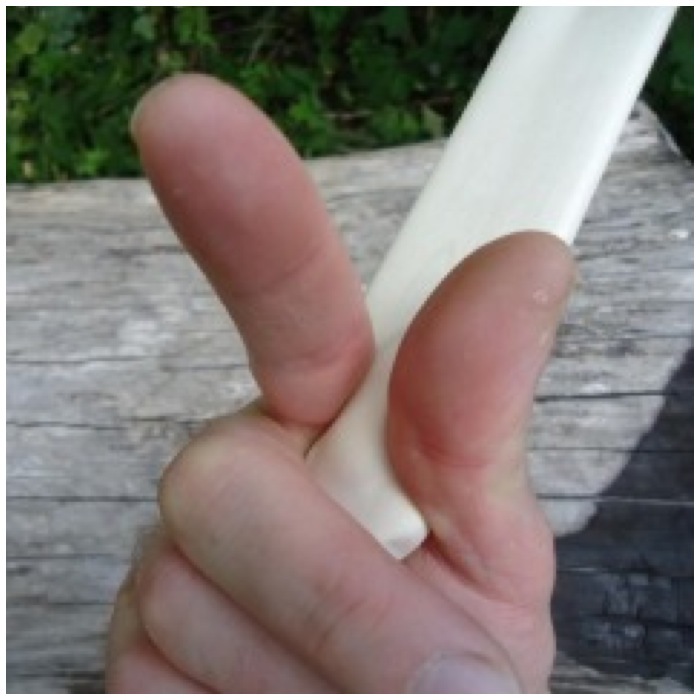 It is easy to flick with an open grip as the thumb and forefinger grooves keep the Atlatl fixed in the correct position in a throw. As I carved the handle to fit my palm it makes for a very comfortable closed grip. After carving little notches around each prong I wrapped false sinew to the tail using a Constrictor knot. I kept it fairly tight but you may wish to experiment here. 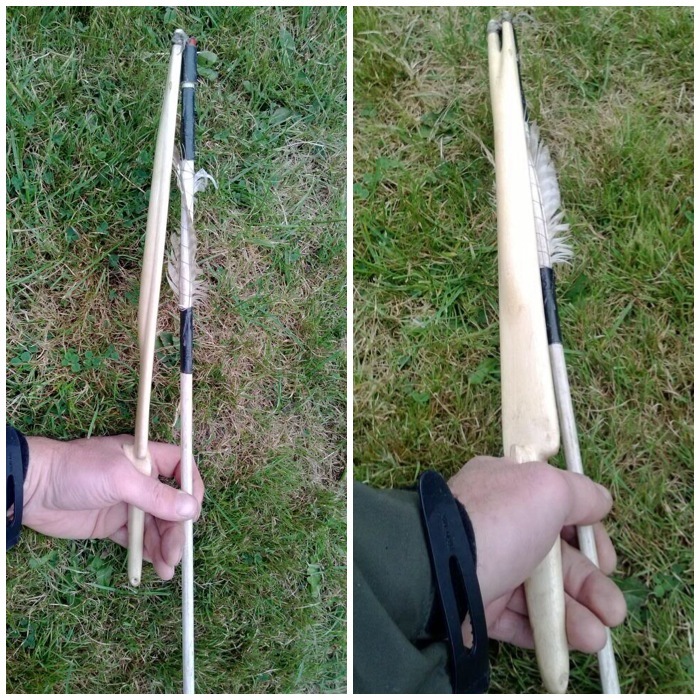 As I said earlier there is nothing in the archaeological record to prove this method was used but after experimenting with other Atlatls like the Split Stick method I see no reason why it could not have been used if a point was not available. The problem with cordage however is that when you are in the act of throwing a dart, various forces are exerted on it. As you release the dart will flex/bend, and the cordage may cause the tail of the dart (fixed in place by the cordage) to go out of line with the point of the dart, thus decreasing accuracy. Having a point at the rear of the Atlatl holding the tail of the dart in place allows the tail to rotate with the point as it flexes during a throw, maintaining the dart’s accuracy. Chris from Paleoarts explains it well in a post on the Paleoplanet site. I will be experimenting with attaching a bone or wooden spur to the Atlatl in future. I am left handed and even though the shape of the handle is designed for a right hander (the slightly protruding piece of the handle to trap the thumb and the smoothed corner to fit in the palm) it is very comfortable still to shoot left handed. I enjoyed making this Atlatl and shooting it over the last few years. It would be great to see some more of this style being reproduced as there are so few to be found. Recently I posted an article titled – Atlatls – What they are and why I love them where I said I would be publishing a couple of How To…. guides on making them. 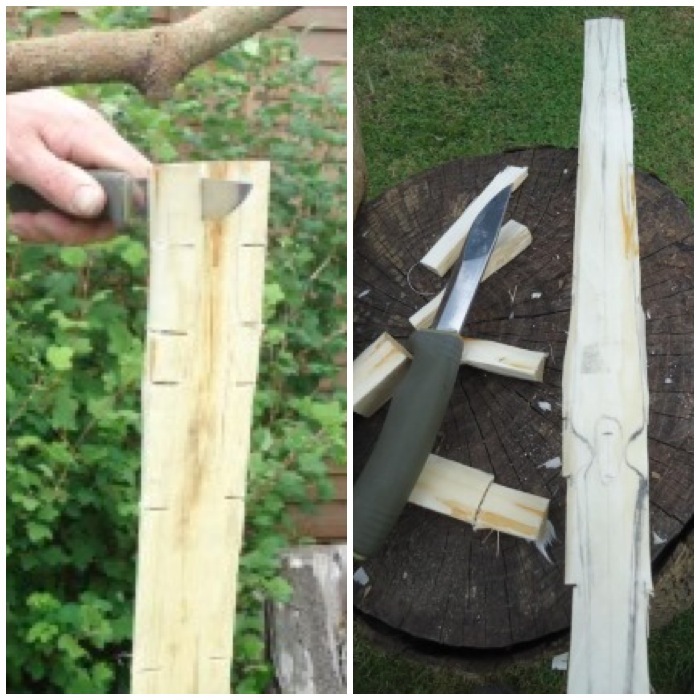 This is the first of these guides on making what I call the One Stick – Split Stick Atlatl. As explained in the previous article, an Atlatl is basically a spear-chucking device. 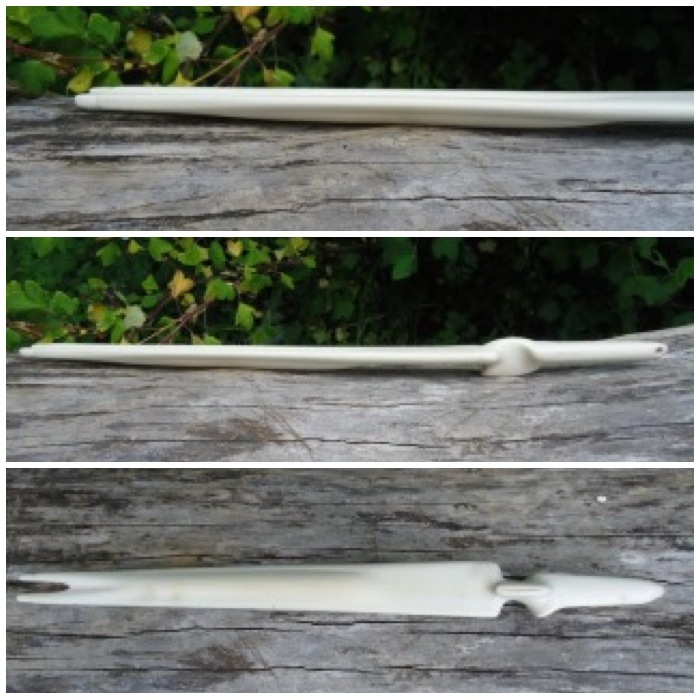 Many different types have been made by different societies: there is nothing in the archaeological record (as far as I know) of this type of Atlatl, but then as it’s made completely of organic material there is no surprise there. I decided to investigate this type after researching the Lovelock Cave Atlatl. There is debate over how darts were launched by that Atlatl and whether a point was used or whether a strip of cordage was used. 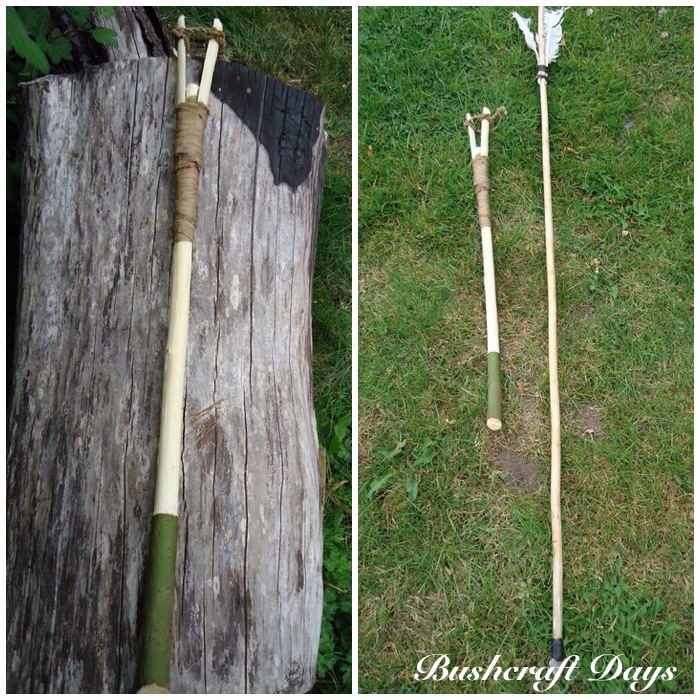 The One Stick -Split Stick Atlatl I made for this post was done using primitive tools only and a single shoot of goat willow (Salix caprea). I made the Atlatl just to prove to myself I could make one out of a single stick (shaft, wedge and cordage). 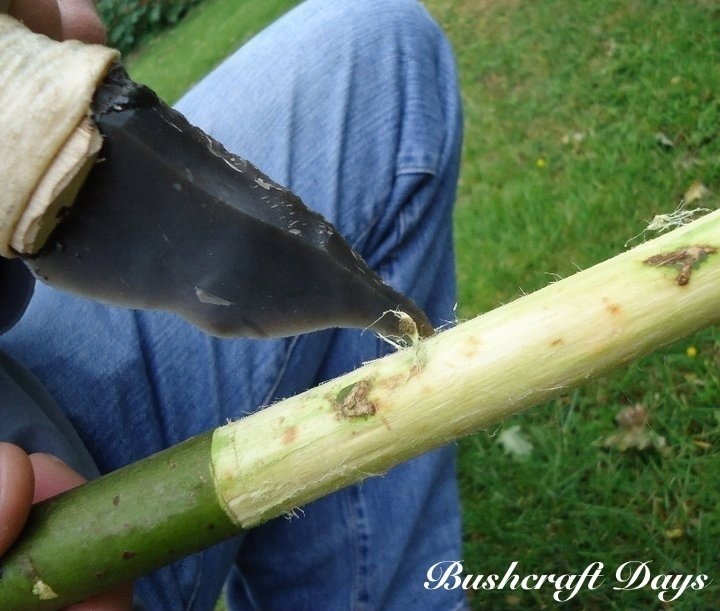 All you would need to make one using modern tools would be a good sharp knife. 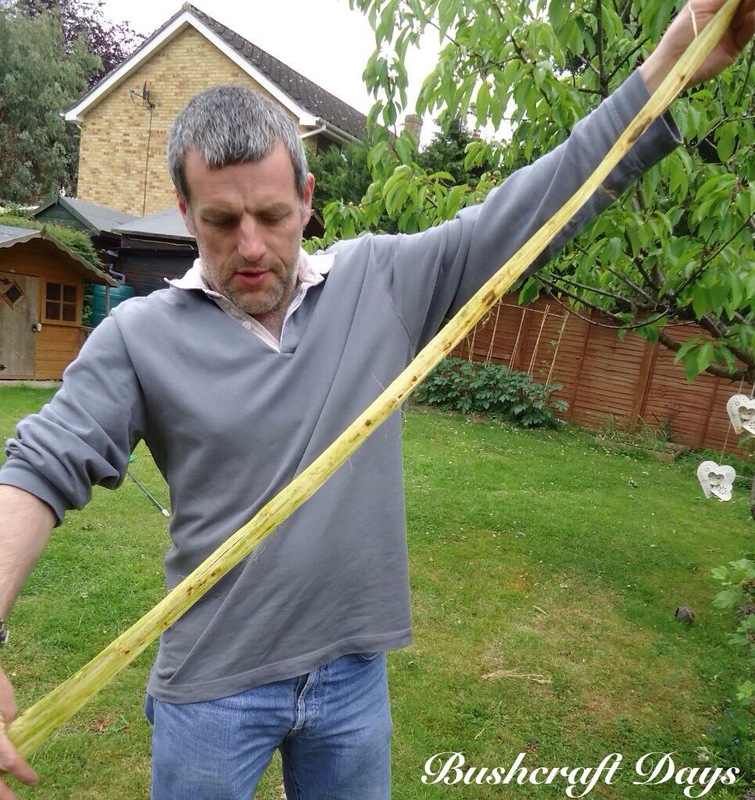 The piece of willow I selected was about 1.5 metres long and about the thickness of my thumb. 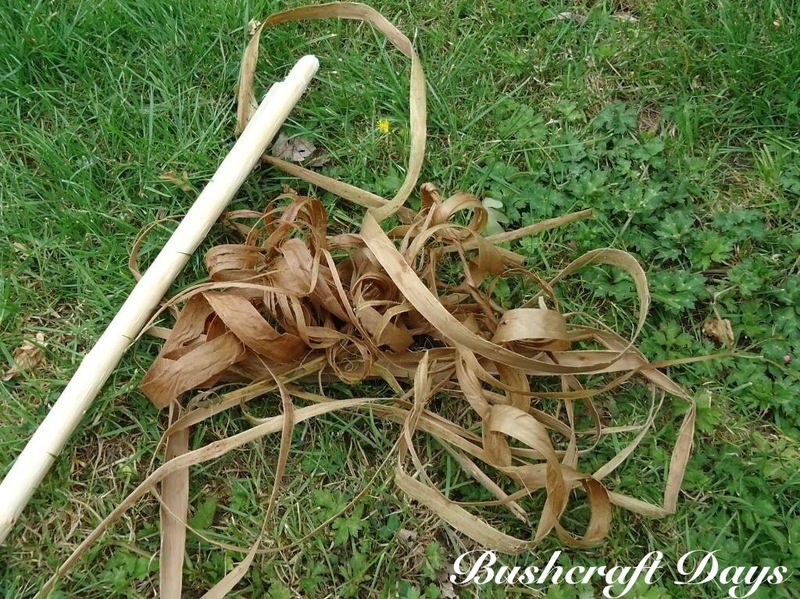 This was far longer than needed but I wanted it this length to get lots of cordage from the bark and to use part of the excess wood as a wedge (needed in making this type of Atlatl). The first thing I did was to cut into the bark all the way around the stick about 12cms from the thickest end, leaving an area of bark slightly larger than my fist. This bark-covered end acts as a handle area. I used an old deer rib bone to scrape the dark outer layer of the bark off rest of the stick, leaving the handle untouched. 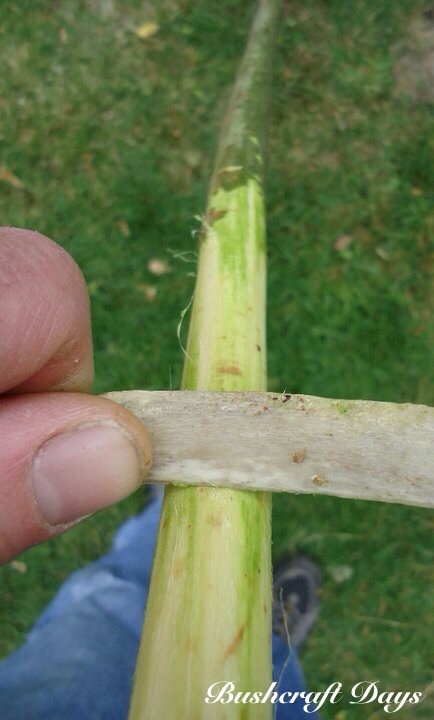 If you leave this on the bark, the cordage you make from it will not of the highest quality. After scraping off all the bark I re-cut around the stick just above the handle area to make sure all the inner bark was disconnected from the handle area. 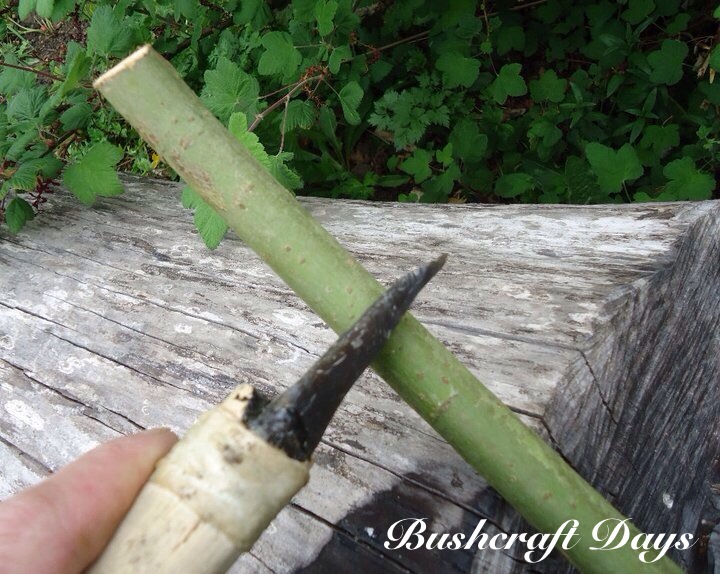 I then cut a line through the inner bark from the handle to the end of the stick to start to open the bark up. I used my thumbs to peel open the bark. Other tools that make this job easier are a small wooden wedge or the back of your knife blade. In late spring the bark comes off easily so my thumbs were all I needed. Wherever possible try and take the bark off in one piece so you can make long strands for easy cordage making. Do not worry if this does not happen, all it means is that your cordage may take slightly longer to make. 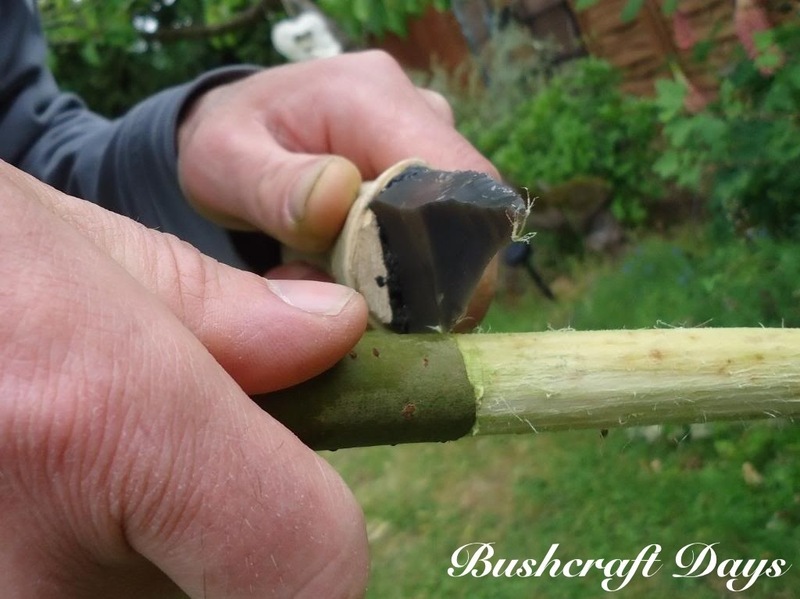 I wedged the flint knife into a groove in the log and then sliced the bark into strips. I managed to get a good amount of strips out of this one piece of bark. I then left the strips to dry out in the sun. Cordage is best made from rewetted strips of bark as the bark shrinks considerably when it is dried out for the first time. 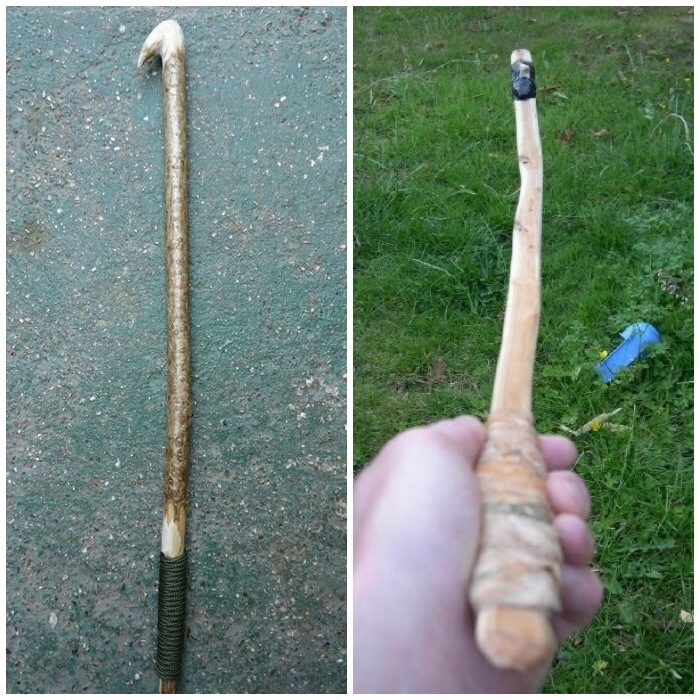 I decided that I wanted my Atlatl to be about 64cms long (fingertip to armpit for me) so I used a piece of flint knapped as a discoidal (curved) knife to saw through the stick. This takes far longer than using a modern knife but I find far more satisfying. Keep sawing until you can feel you can snap the wood without splitting it down its length. 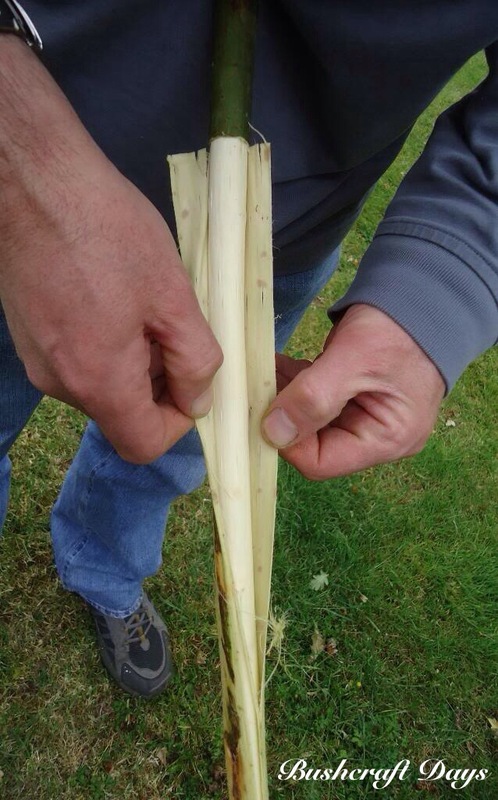 Once snapped, trim the end of the Atlatl smooth. The spare piece of wood needs to be trimmed down and cut to size to make a wedge. This will be used to form the split stick part of the Atlatl. 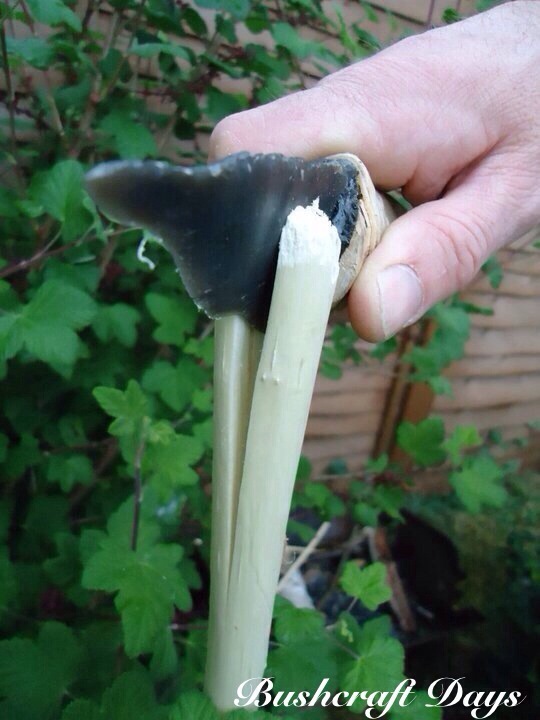 I used my flint adze at first to blank out the wedge, making it about 10cms long. 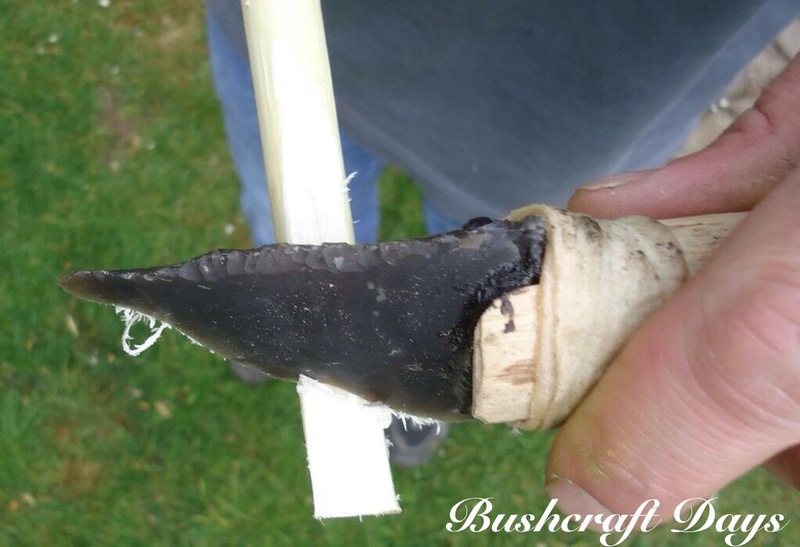 Then I used my flint knife to trim the wedge to its final shape. 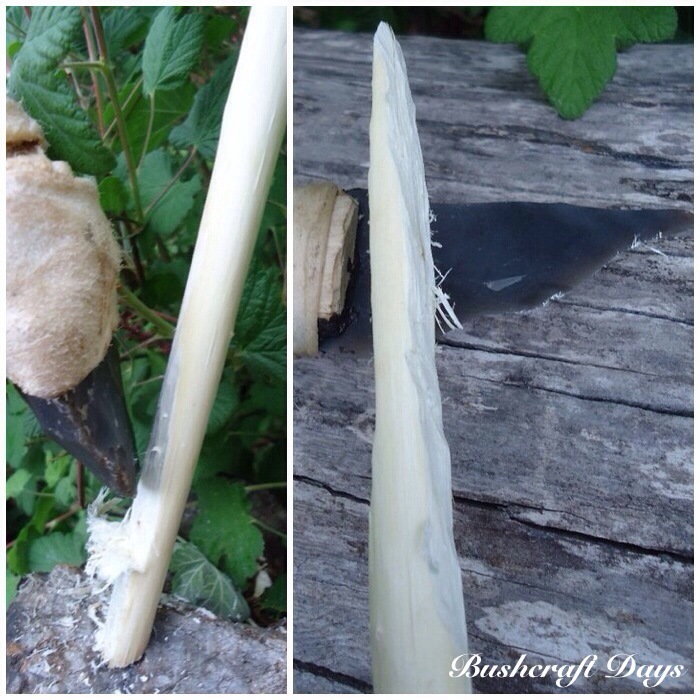 I used my flint knife to split the non-handle end of the Atlatl open. As the knife has a flat spine I just hit the back of the knife to start the split. Be careful to keep the split in the middle of the stick. A piece of cordage should really be tied off on the shaft where you want the split to stop. I forgot to do this but thankfully the split did not travel too far. I made my split 20cms long. 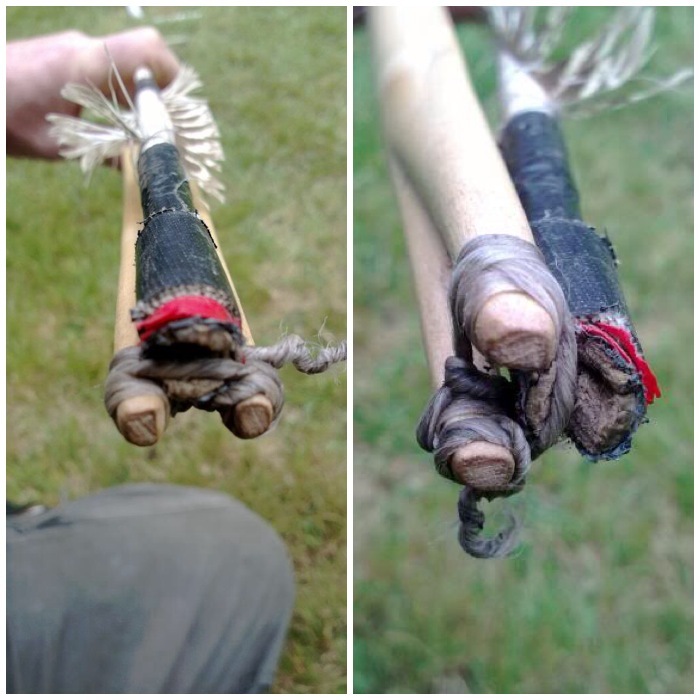 I used my discoidal knife to create a small groove around each split limb for the cordage to grip onto. 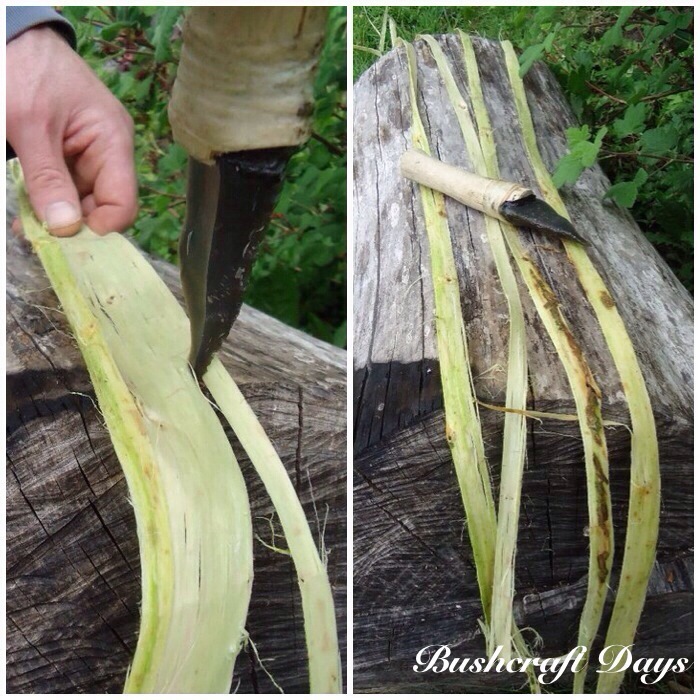 Before inserting the wedge I did tie off the split with some of the dried bark using a constrictor knot. Insert the wedge but with the base of the split tied off. Afterwards I used more of the bark strips to secure the wedge by wrapping them around it to hold it secure. 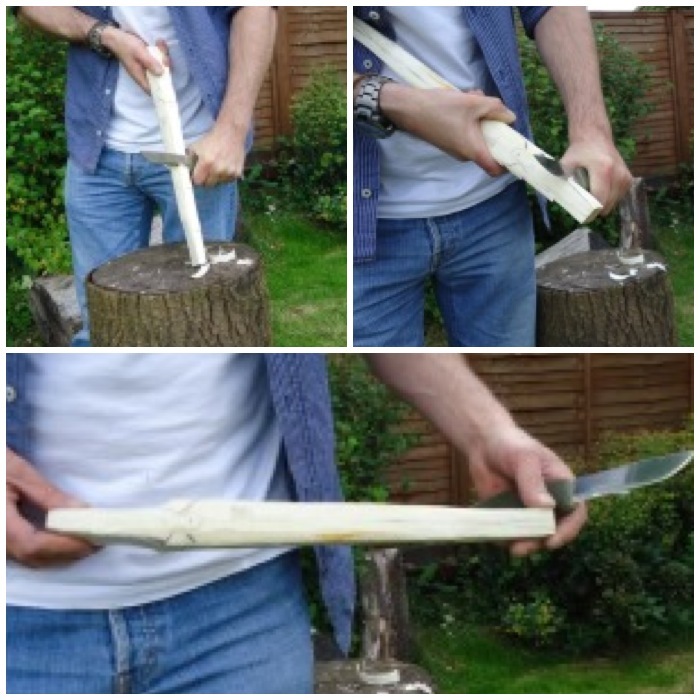 I had plenty of bark left over after this, which was good as I wanted to make some cordage to create a strap to hold the dart in place before launching. I completed a piece of cordage about 50cms long to give me plenty to tie onto the Atlatl. I used a constrictor knot on each split to hold the cord in place. 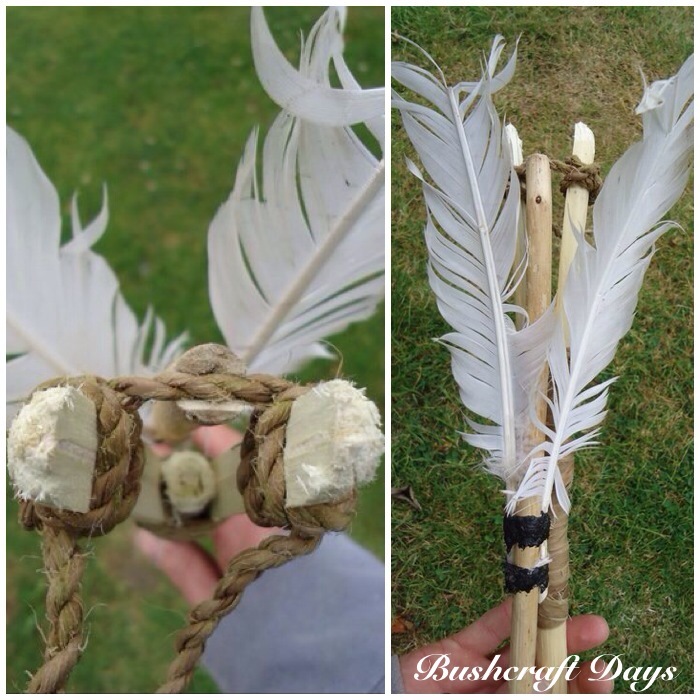 Jonsbushcraft blog has an excellent tutorial on making cordage. I was very happy with how this Atlatl turned out. You can see the dart has a groove instead of a hole at the end. This allows the cordage to hold the dart in place before launching. 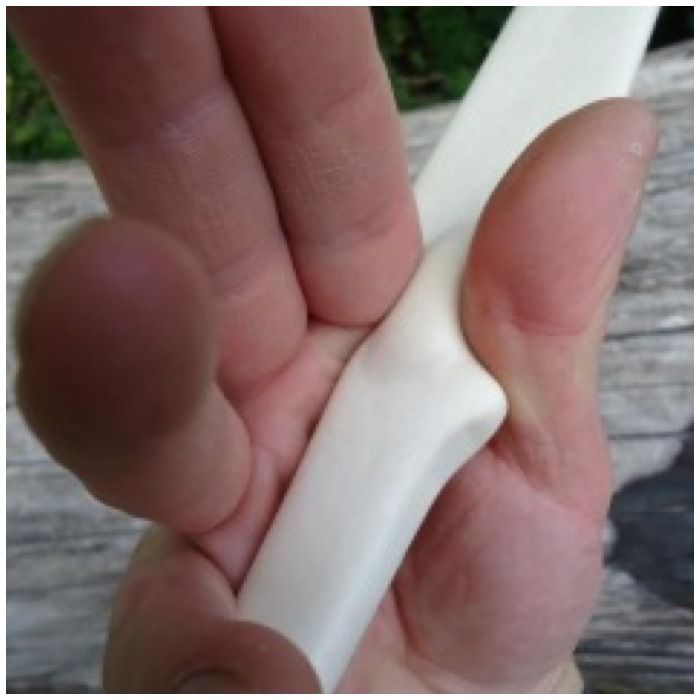 The finger pinch hold is just the same as a normal Atlatl with a point. I think the launch with this type of Atlatl feels slightly different but once you get used to it I find the release is as smooth as it is with a normal pointed one. 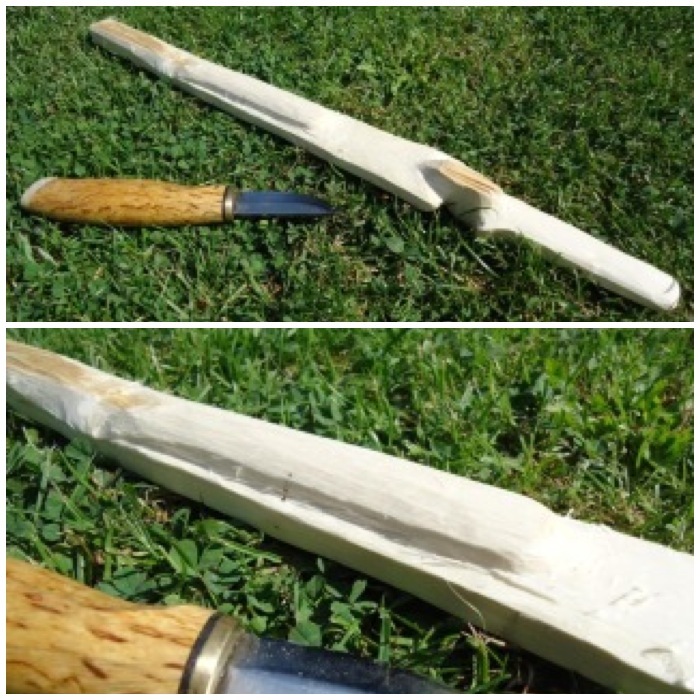 I made this Atlatl purely for the joy of making one with primitive tools and to see if it was possible to produce a hunting tool out of just a single stick. I have no idea whether hunters in pre-history used this type of Atlatl but I certainly now know they would have found it the easiest thing in the world for them to make. 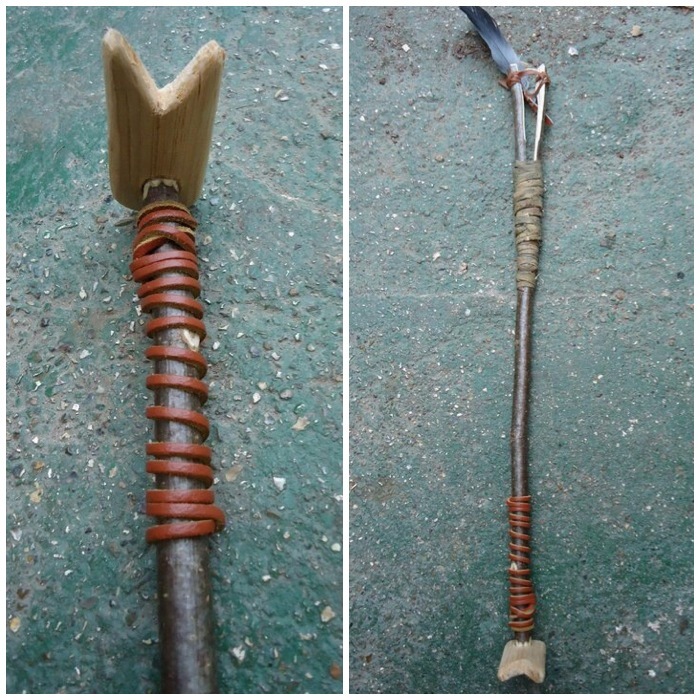 A good post on some other Other Types of Atlatls: Loop, Fork and Cord was written by Mike Richardson on the Primitiveways website. I’ve mentioned the Atlatl several times in previous blogs, so I thought it was high time I wrote a post devoted to this, one of my very favourite bushcraft activities. 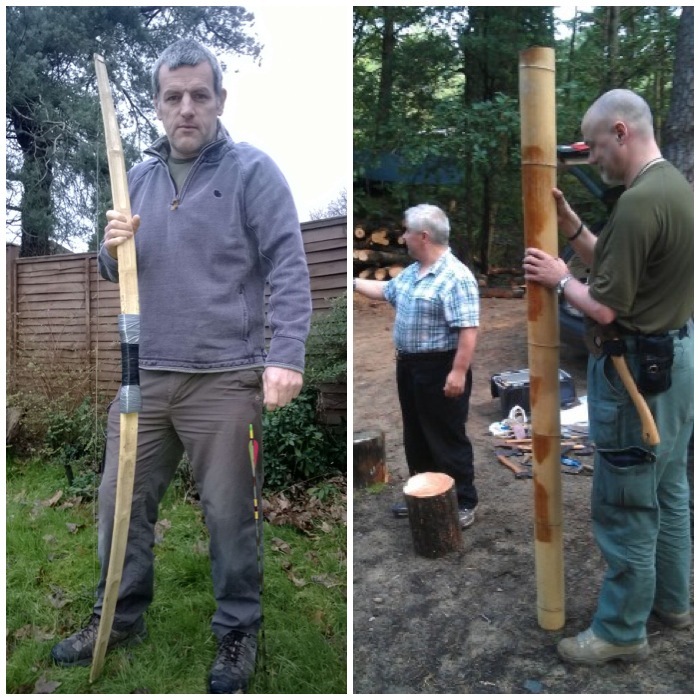 I’m going to introduce you to the three different types of Atlatl I use when teaching this art, together with some historical references to them I’ve found in the course of my research. 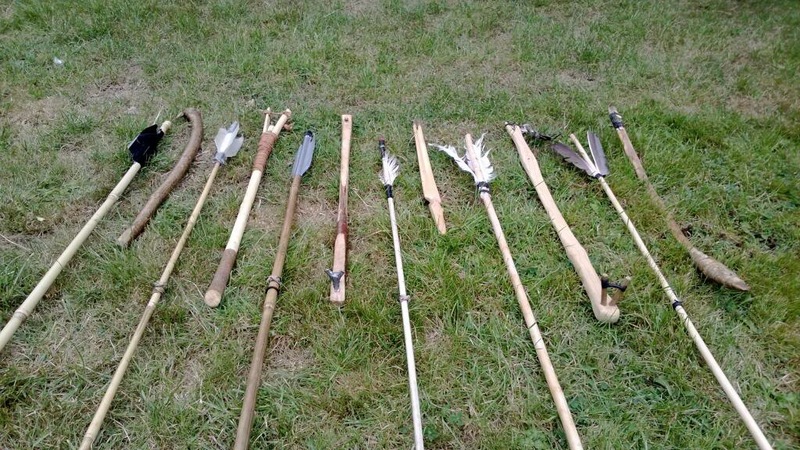 For one of my types of Atlatl there is no historical record, and the exact makeup of other types are sometimes just a best guess, so please feel free to leave comments if you know more, as it is all a big learning curve for me. 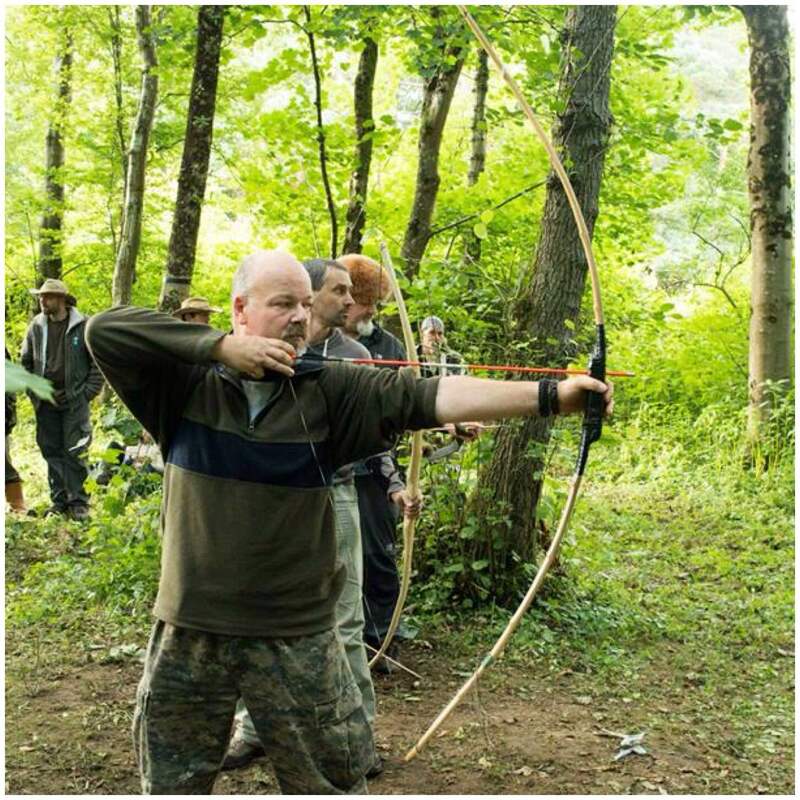 There are many different types of Atlatl but here I will concentrate on the three I regularly use. An Atlatl is a spear-chucking device traditionally used for hunting or combat purposes It was developed in pre-history by many different societies. 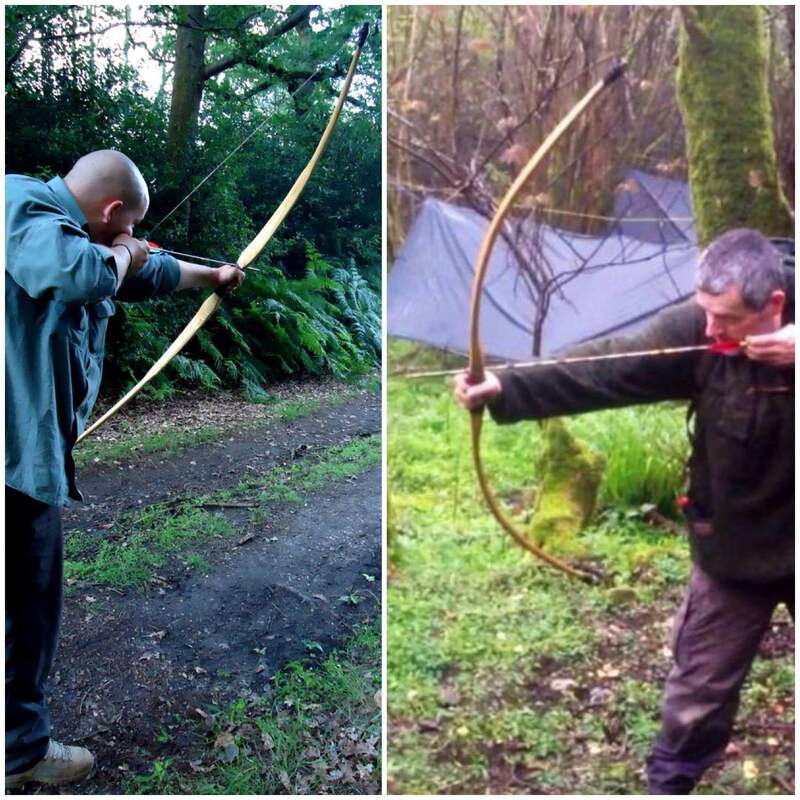 Some societies still use the Atlatl to this day, others used it alongside the bow while other societies stopped using the Atlatl after they developed bows. An excellent modern day comparison to help you understand how an Atlatl works is to watch a dog walker using a plastic tennis ball thrower. 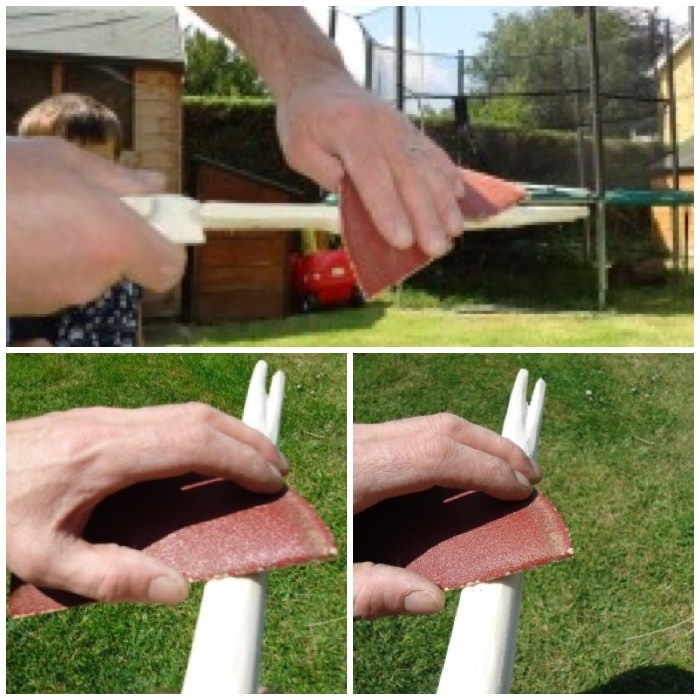 The ball travels much further than normal as the plastic ball thrower extends the thrower’s arm length and as the arm sweeps forward the plastic thrower is bent back, storing energy. This energy is released as the thrower does a final flick of the wrist. The dog is happy as it gets a longer run and the thrower is happy as he gets longer between throws :-). The name Atlatl comes from the Aztec society but in Australia it is known as the Woomera. An excellent overview of the Atlatl can be found in Wikipedia. 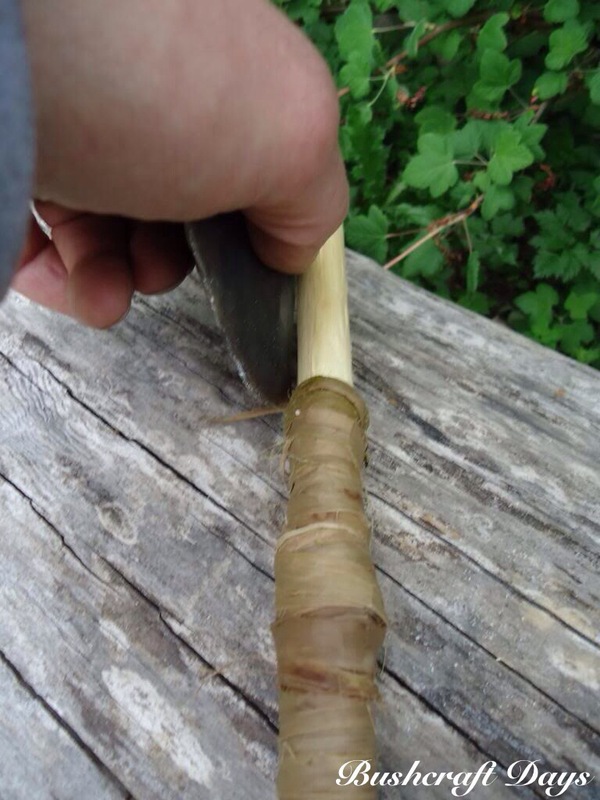 I like Atlatls as they are relatively simple to make, cost me next to nothing to make, students can make them and learn to use them easily and will provide hours of fun for kids from the age of about three years up (I still classify myself as a big kid). When teaching this skill I always set up a proper range so that the darts can be thrown safely. I normally work on a range of about ten to twenty metres but a good Atlatl can reach up to a hundred metres in a competent thrower’s hands. 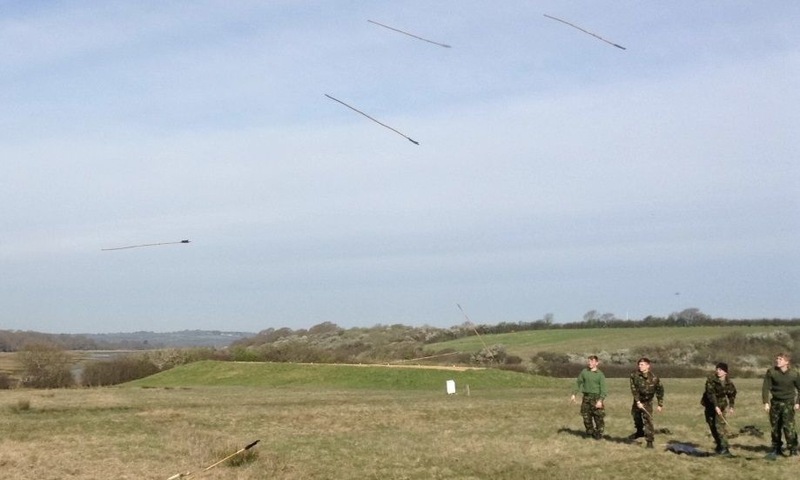 I made a short video last year showing the Atlatls in action with some of my Sea cadets – Video of Atlatls in Action. 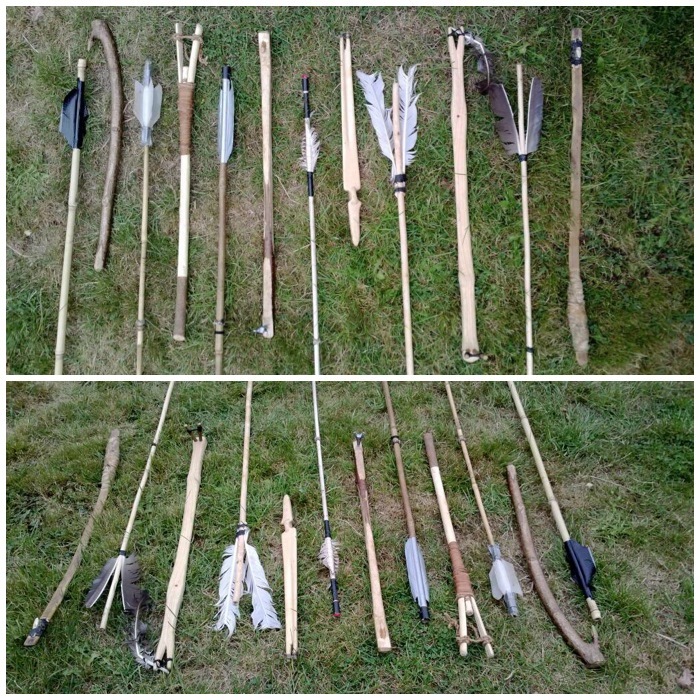 Here is a selection of some of my Atlatls. I will be posting in the near future a couple of How To…. 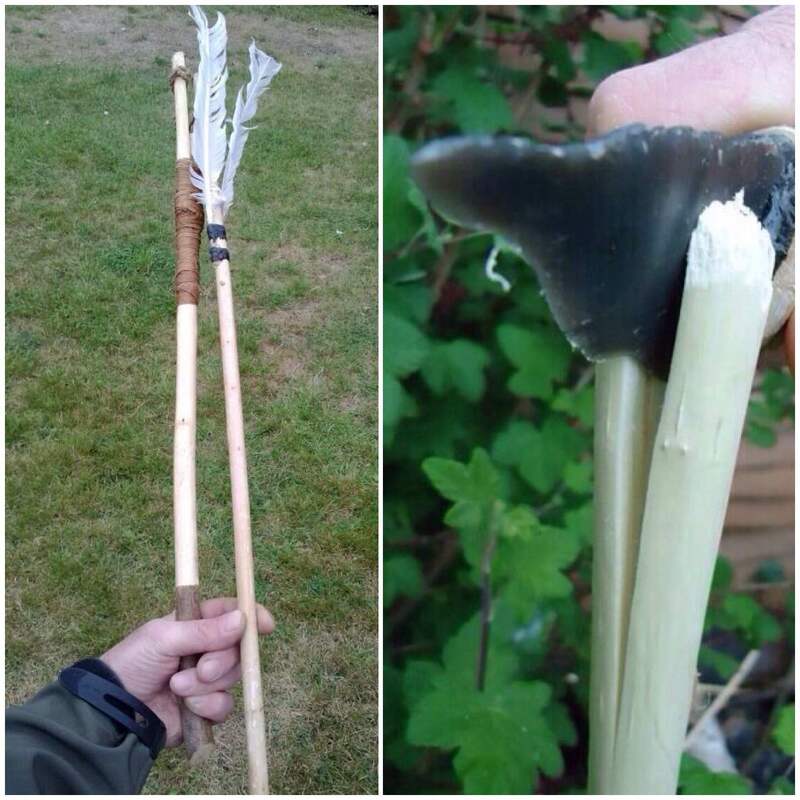 guides on making some of these Atlatls. 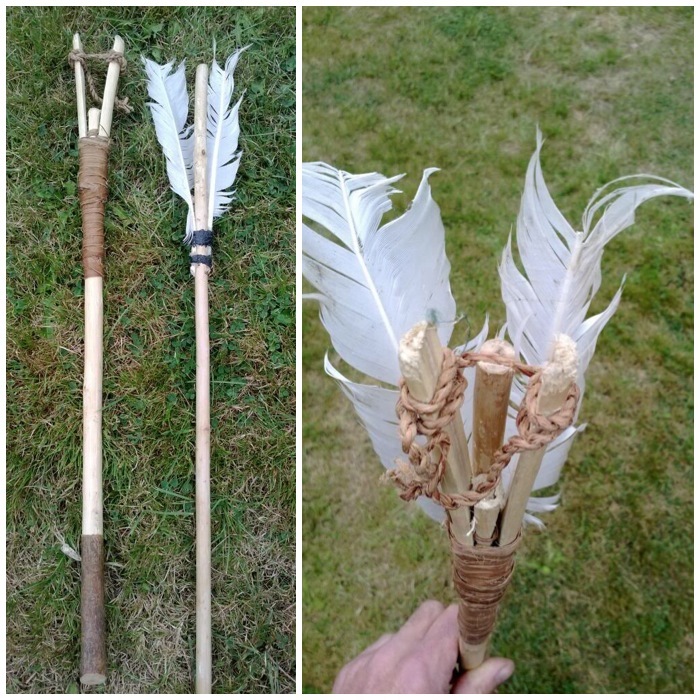 I have simple Atlatls that just have a point at the rear to attach the dart to, Split Stick Atlatls with cordage instead of a point, and other Atlatls that have a front ‘Y’ rest for the dart. 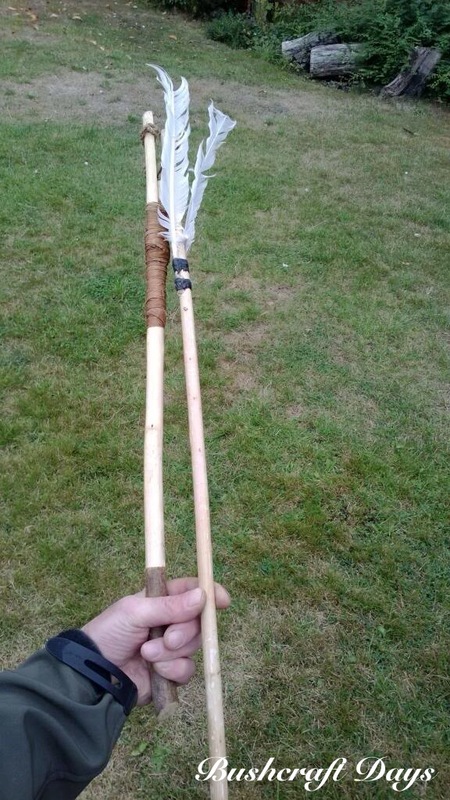 The simple type of Atlatl shown below on the left just has a point at the rear to hold the dart in place before releasing it. You will see how this works later in the post. 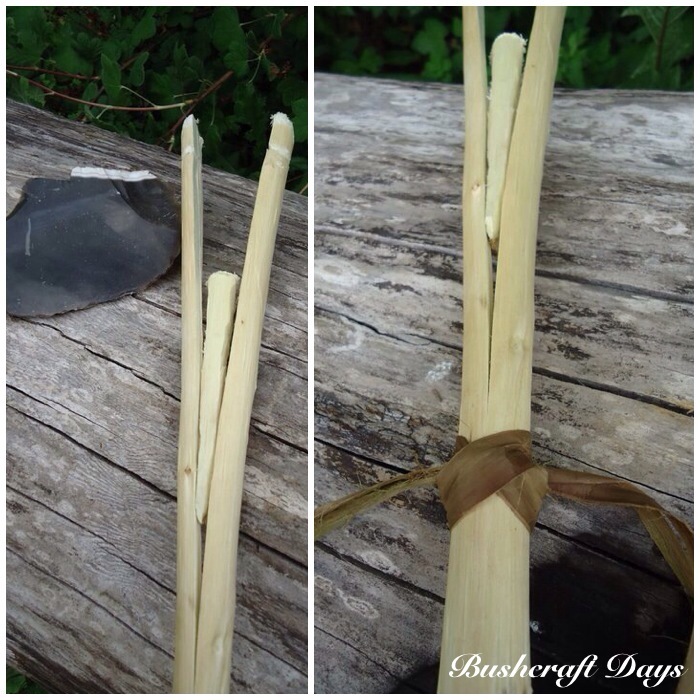 This is the easiest type of Atlatl to make. I generally use the base of a piece of hazel coppice (lots of other woods will work as well) for this where there is a fork in the wood near the ground. All I have to do is after cutting the shoot is to shape the smaller fork into a point with a knife and whip a para cord handle onto the main. 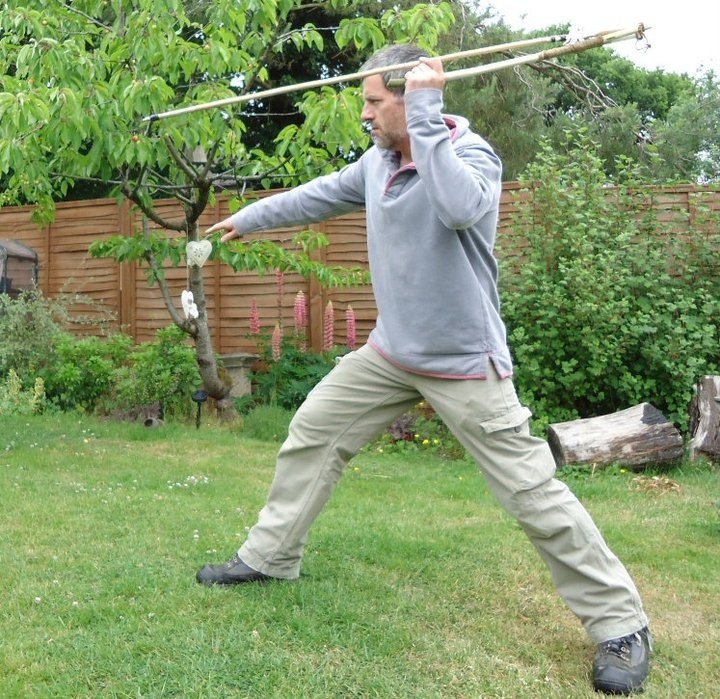 The Primitive Ways website gives an excellent description of constructing a simple Atlatl. 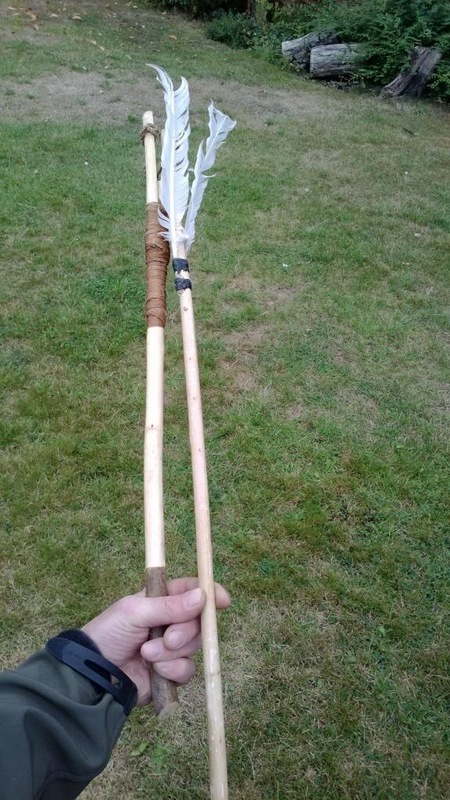 The Atlatl on the right is also a simple one but made in a primitive manner, without modern tools. 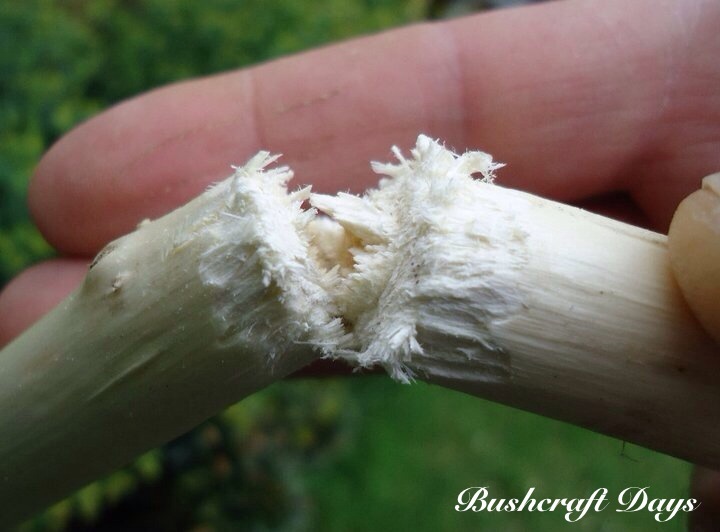 I used a thin yew branch, attached a rawhide handle and attached a carved antler point to the back. 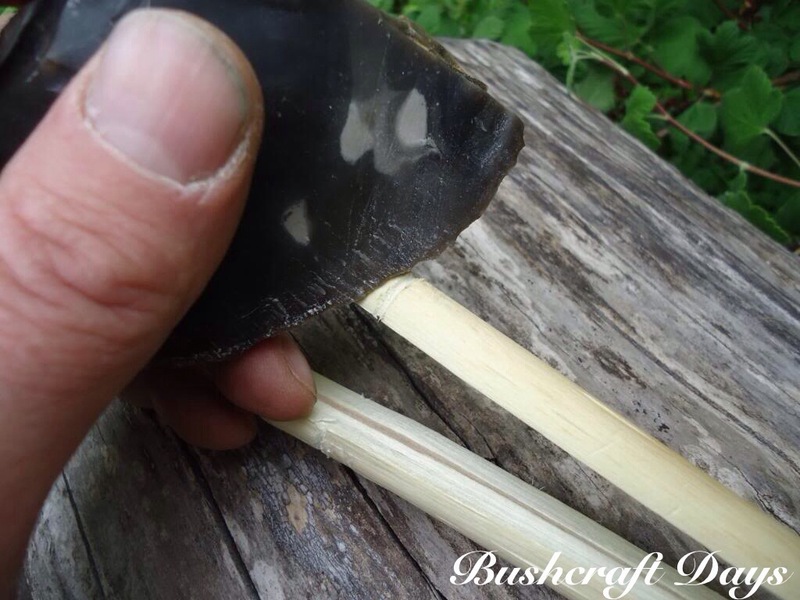 Once you have mastered the finger pinch grip these simple Atlatls are very easy to use and great fun can be had at very little cost. The Atlatl gives greater power to your throw by extending your arm length, enabling you to throw the dart faster and further. 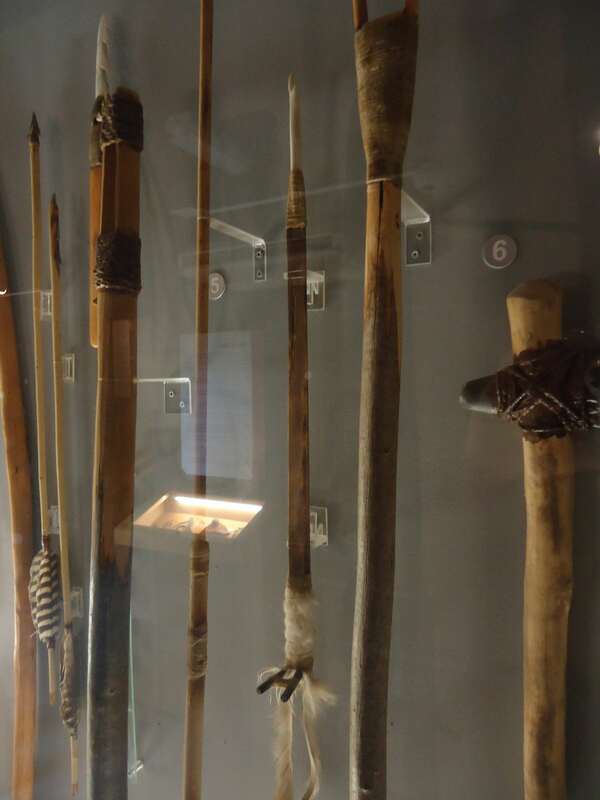 I was on holiday in the Cheddar Gorge area of the UK a few years ago and spotted in the Museum of Prehistory some reproduction Atlatls on display. They had been reproduced as closely as possible to Atlatl finds in the local caves. One of them had a forked rest and I found that intriguing, as up to that point I had not found any reference to this type of Atlatl. 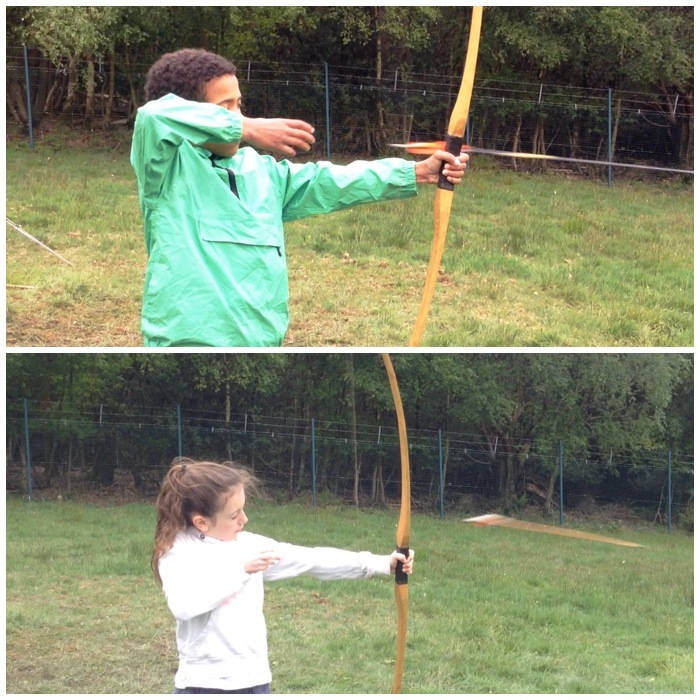 I soon found out that this style of Atlatl with a front rest is great for kids. As the dart is supported by the rest no finger pinch grip is required, making it easy for kids as young as three to use this type of Atlatl. 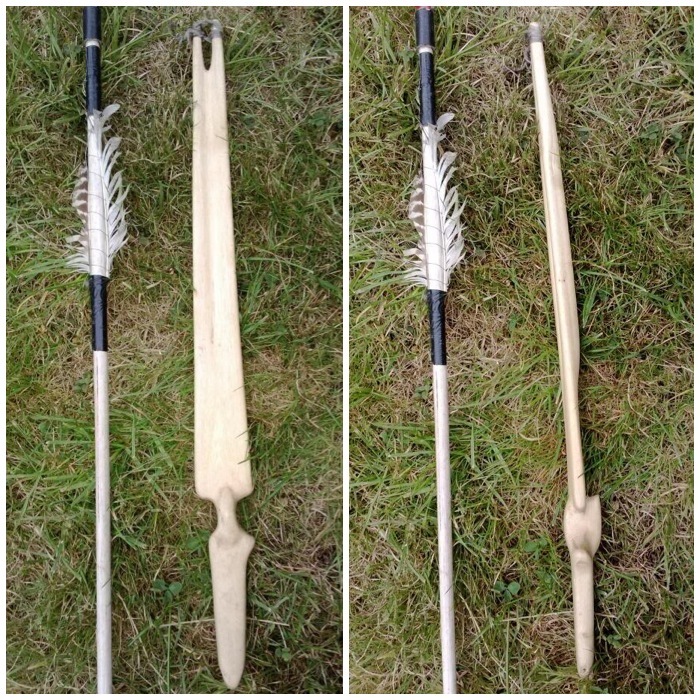 In my research into this type of Atlatl I also came across a post by Mike Richardson In Primitive Ways explaining how if the thrower has to wear gloves (for example in arctic environments), the normal finger pinch method of holding the dart is not an option so a rest is attached to the front of the Atlatl. 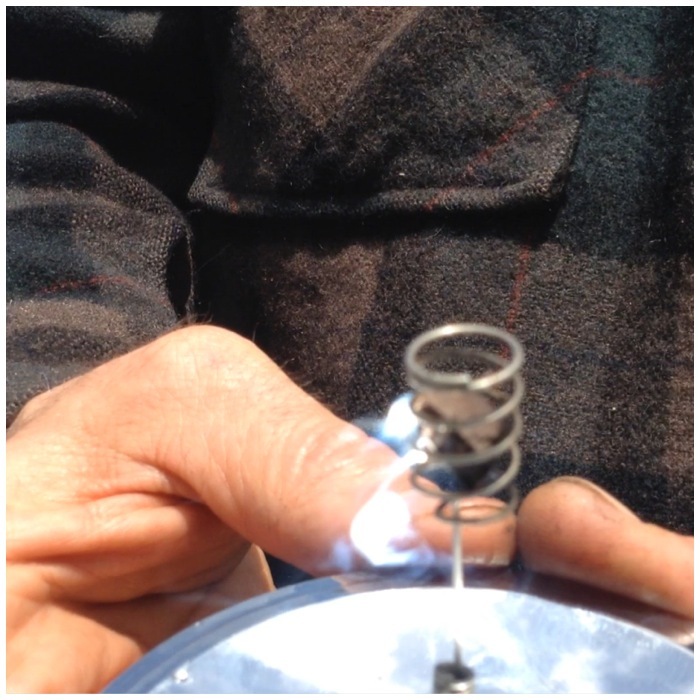 This along with some cordage wrapped around the dart allows the gloved thrower to have the dart locked in place but still easily released with a flick of the wrist. I have used this method numerous times and the cordage wrap/lock has no detrimental effect on the release of the dart. 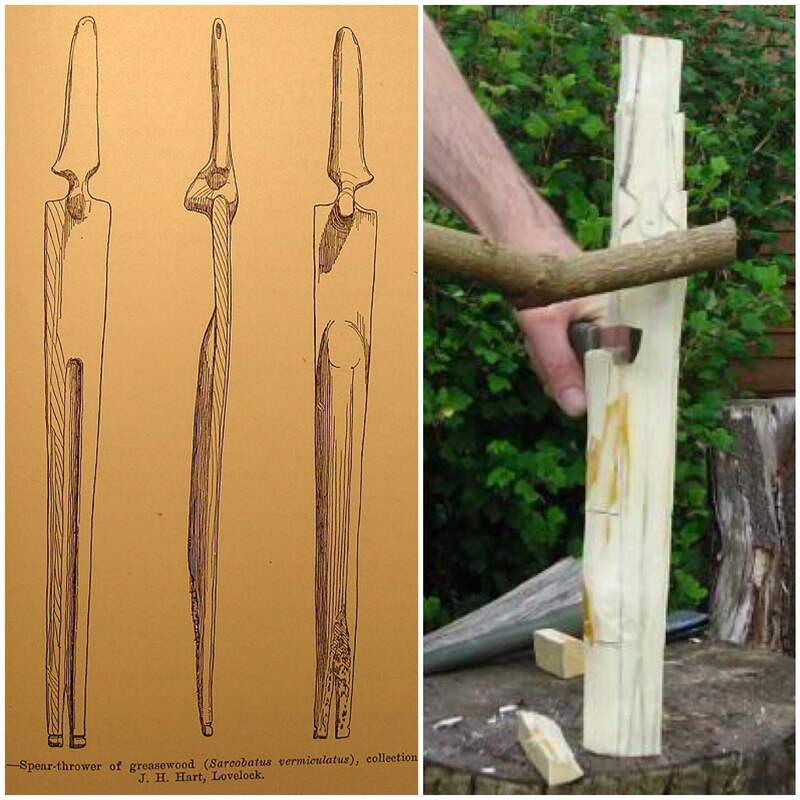 I made some Atlatls up with metal bolts as rests as I found the original wooden rests I had made were easily broken by my cadets so I had to design a ‘Squaddie-proof’ alternative. Not pretty but very effective and robust. In the picture above and the one below you can see that the cordage wrap on the dart is locked up against the fork of the rest, ensuring the dart does not fall off before release. After a short piece of tuition most kids (except the very young) are able to set this up for themselves. 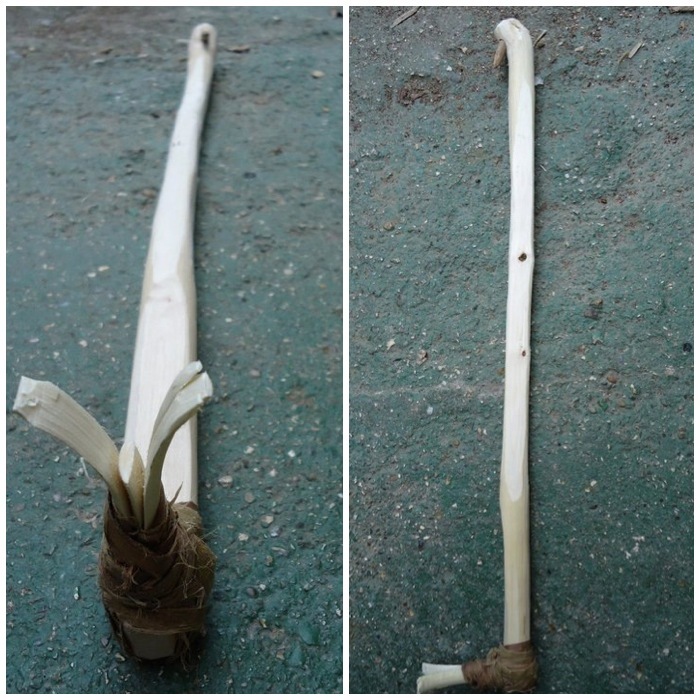 In the picture below you can see a wooden rest I made by wrapping a piece of shaved wood around the shaft of the Atlatl and tying it in place with some natural cordage. I inserted a further wedge piece in the rest to tighten the cordage wrap. This proved an interesting experiment but was too fragile for most of the cadets to use. Again in the picture below you can see that, as with the Atlatl with the bolt, the dart is well locked in place requiring only a flick of the wrist to release it. I have not come across any historical evidence for the cordage wrap on the dart as a holding mechanism. It may not be authentic, but I like it as it opens up the world of Atlatl to the very young who find holding the dart and Atlatl in one hand difficult. The Split Stick Atlatl I found documented on the Primitive Ways website as well. 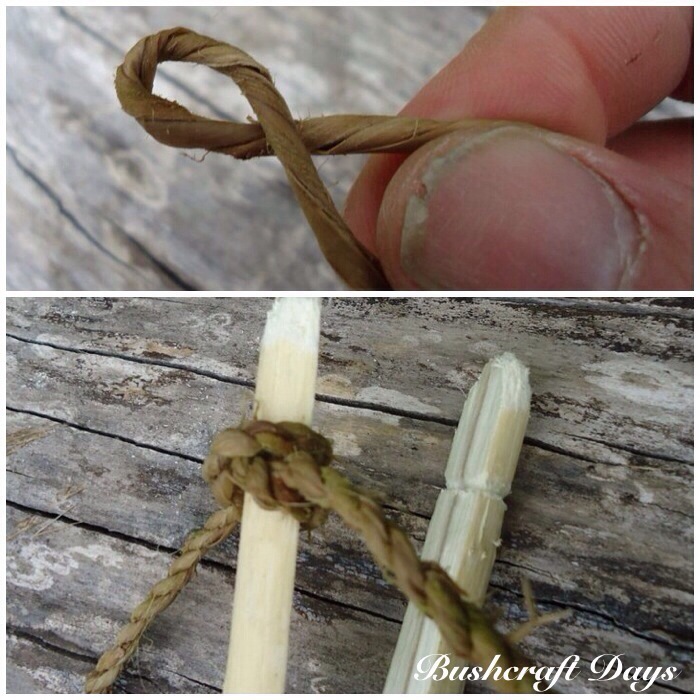 No point is carved at the end but a piece of cordage is used instead to hold the dart in place. There is very little archaeological evidence for this type of Atlatl and much debate if it was ever used but I like it and with a little practice it is just as accurate as an Atlatl with a point. A good online discussion on this can be found in the PaleoPlanet forum. 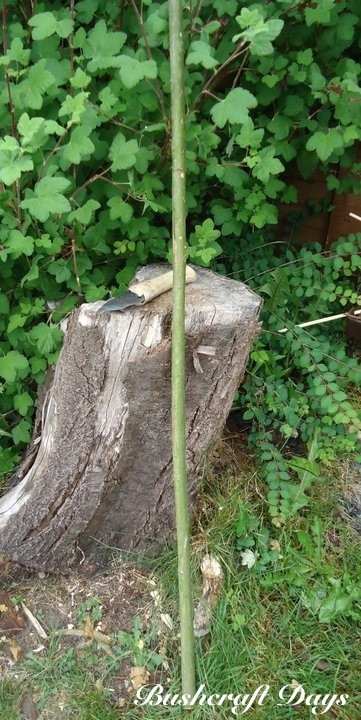 I call this one the ‘One Stick Split Stick Atlatl’: I made the whole thing using primitive tools and out of just one piece of willow just to prove to myself that an Atlatl could have been made just using one straightish piece of stick. I will be posting a How To…. 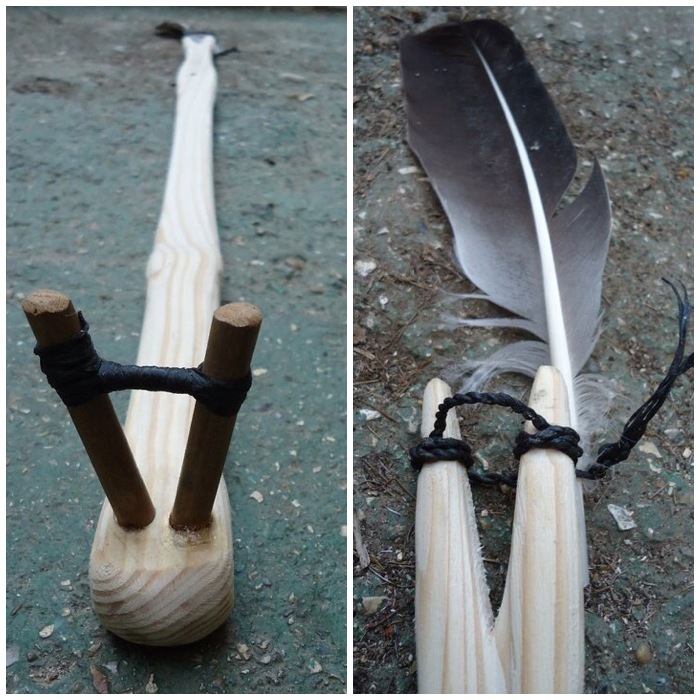 guide on making this Atlatl. 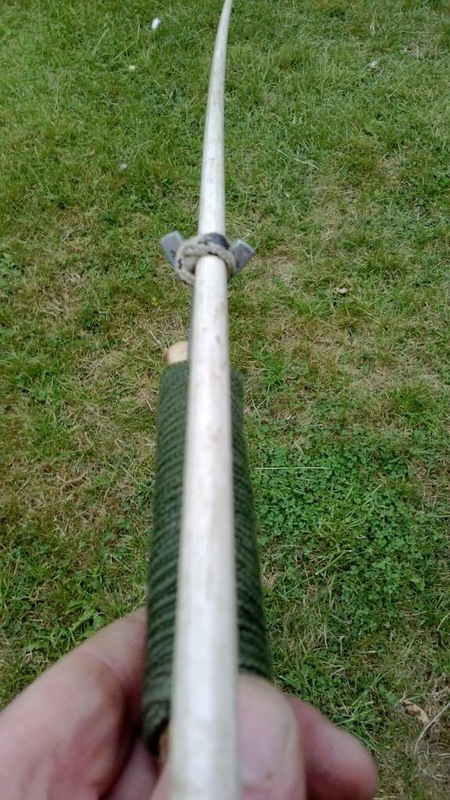 A sideways view of the Atlatl showing the finger pinch grip. 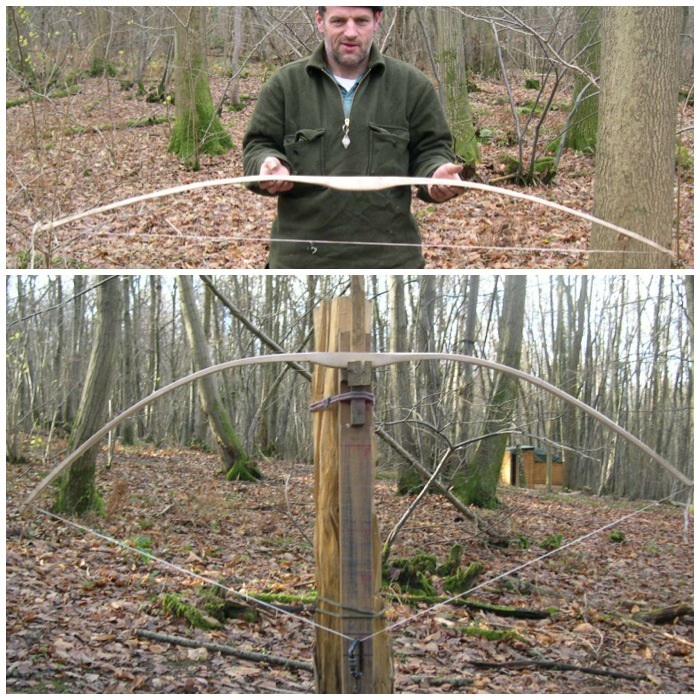 One of my favourite Atlatls is the Lovelock Cave Atlatl which I reproduced as closely to the original as possible. This Atlatl was found in a cave over a century ago but the original was lost; thankfully, though, not before someone had made a detailed drawing of it. A copy of the drawing can be seen in the post by Mike Richardson on the Split Stick Atlatl. 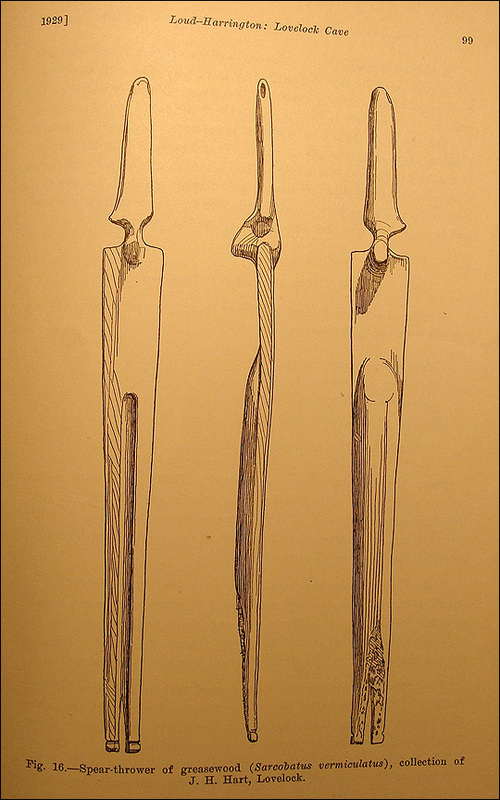 It has a fork at the rear and the drawing shows a small groove around each fork. I have read that this was where a small piece of carved wood or bone was attached as a point to hold the Atlatl. 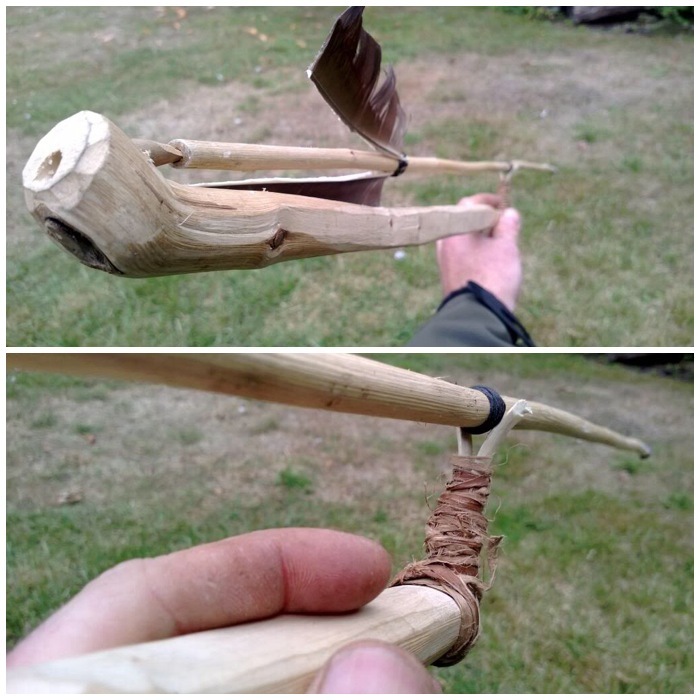 I decided though to see if the Atlatl would work with just some cordage wrapped around it. Again there is no historical evidence that this was done but it does work well. 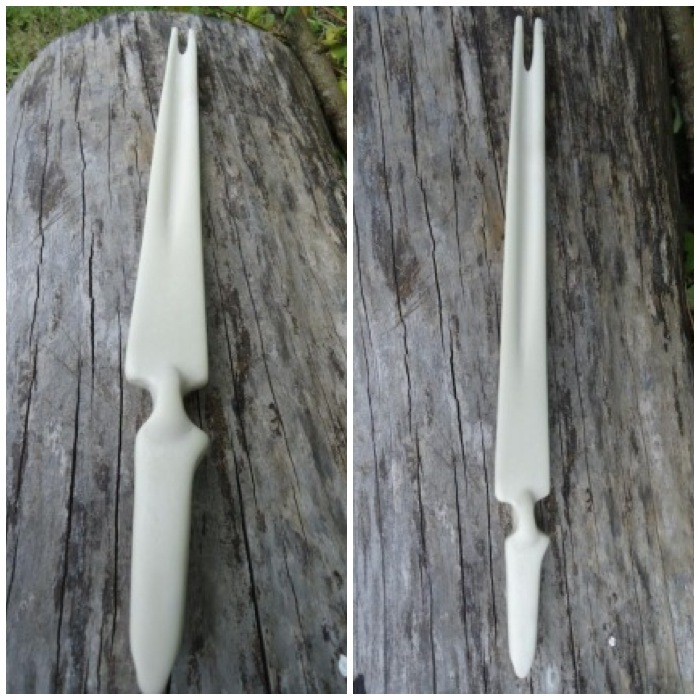 A good comparison of both attachments to the Lovelock Cave Atlatl can be read in the PaleoPlanet forum here. Sideways pictures showing the finger pinch method. A couple of pictures showing the dart attached to the cord wrapped around the fork. A little experiment with a split stick and a rest. The rest did eventually split as the pine wood was quite weak with the hole drilled into it. The rest here is based on the Cheddar Gorge replica I saw but instead of a point at the end I made it into a fork with cordage. This works perfectly well with a bit of practice. I really love making Atlatls and everyone I work with loves to have a go with them. I need to spend some more time on making different types of darts next to go with my shed full of Atlatls.